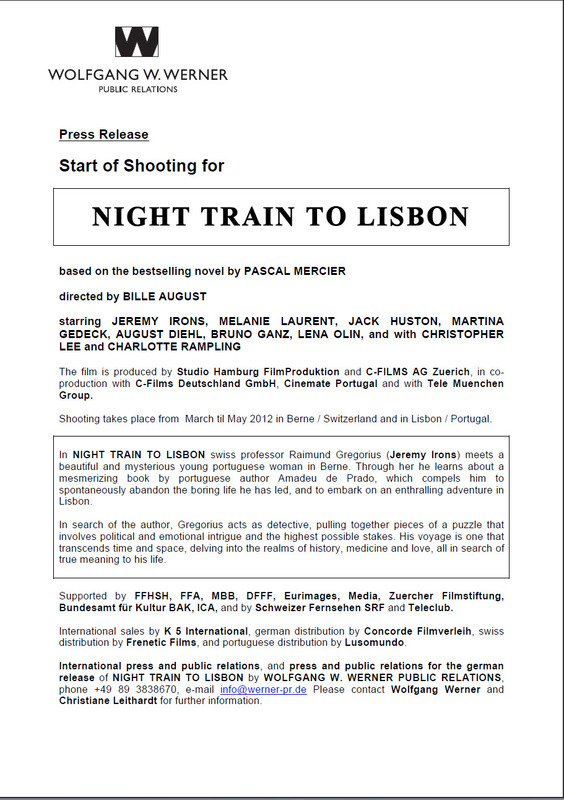 Filming has begun, in Bern, Switzerland, on Jeremy’s latest film Night Train to Lisbon. 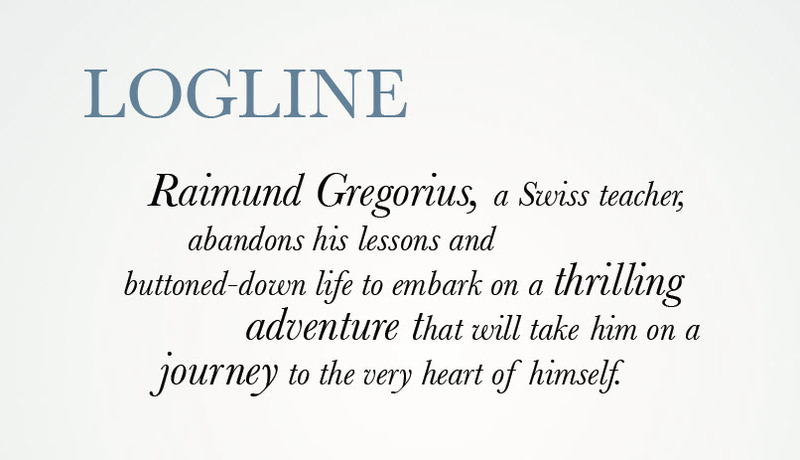 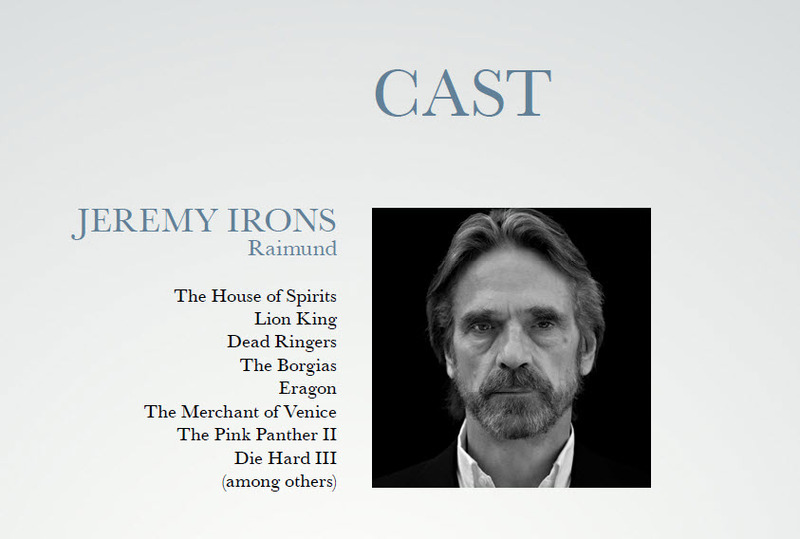 Jeremy plays Raimund Gregorius, the main character from the novel by Pascal Mercier. 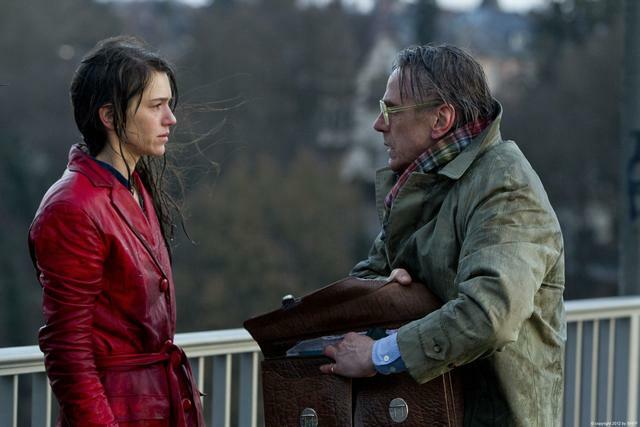 On the Kirchenfeldbrücke yesterday, the most important scenes were shot to international film production, “Night Train to Lisbon”: In this the Bernese school teacher Raimund Gregorius holds on the bridge, a young Portuguese woman on it, to plunge into the river Aare. 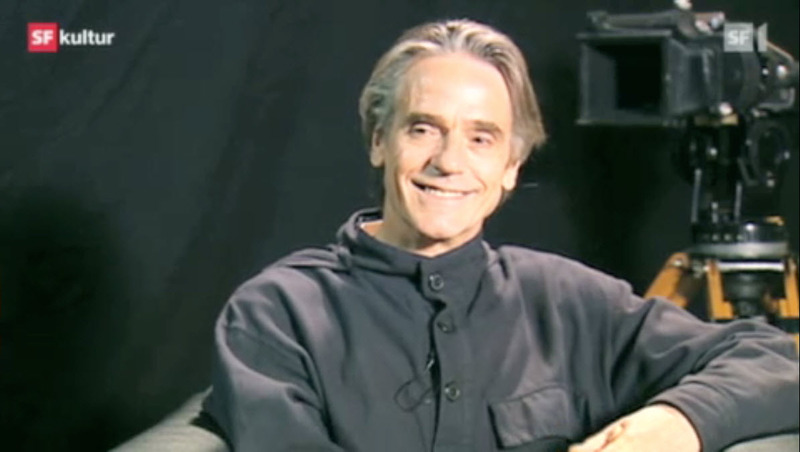 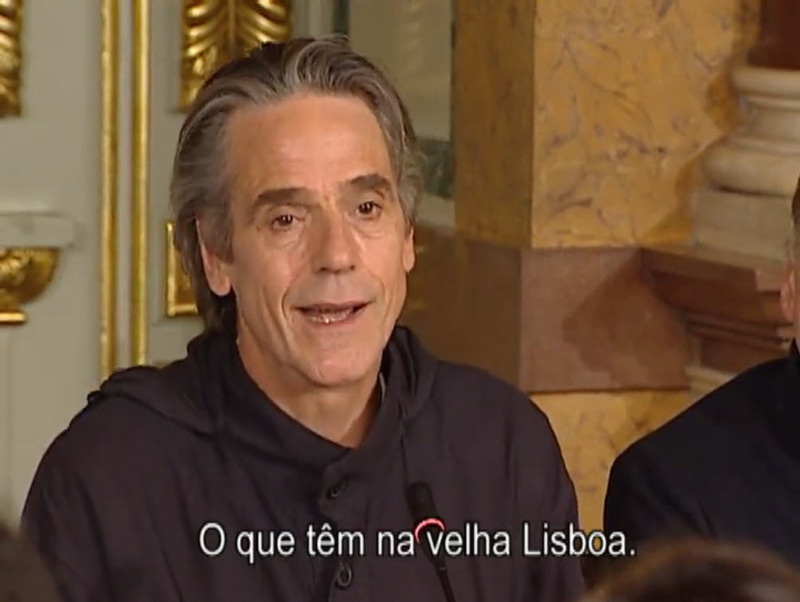 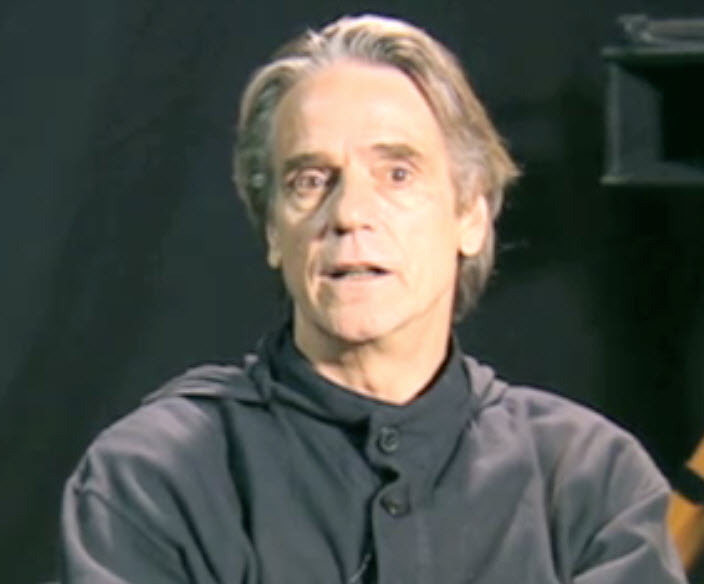 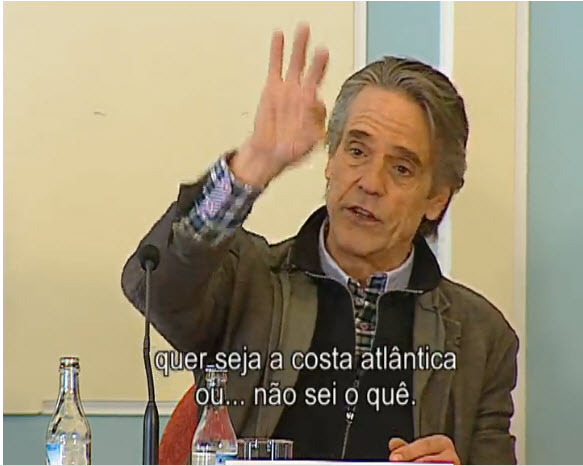 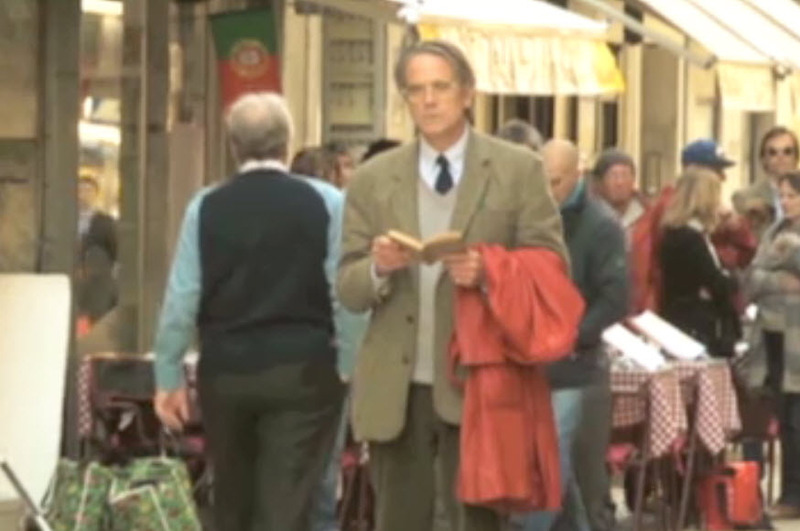 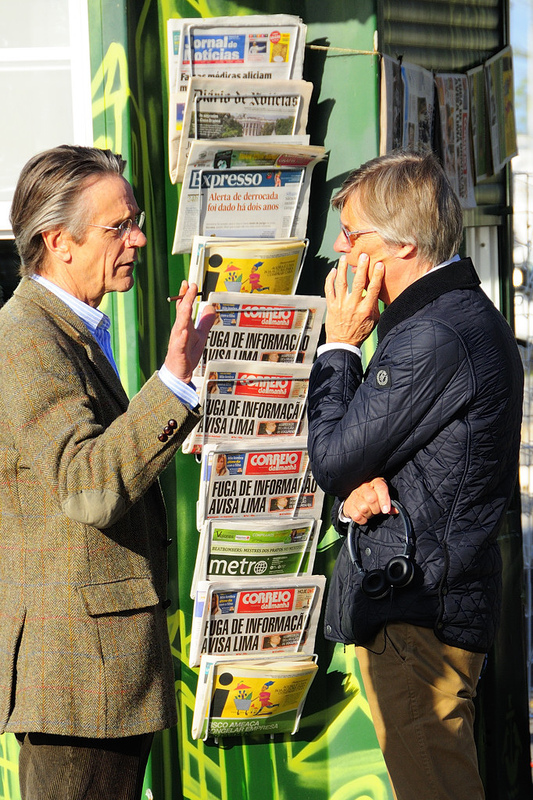 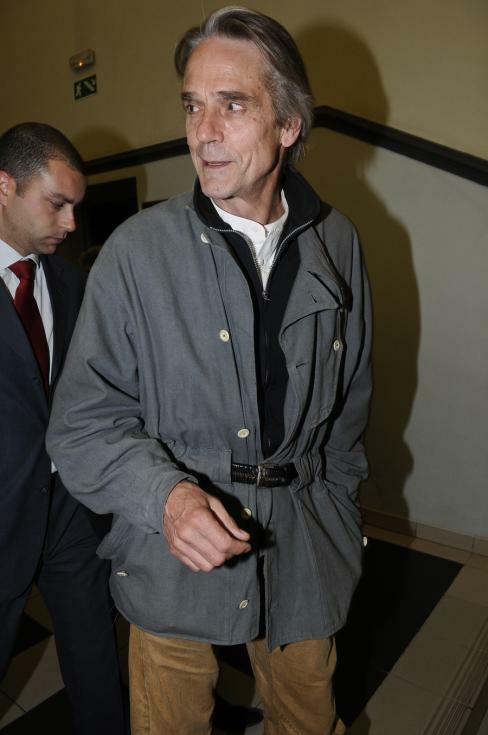 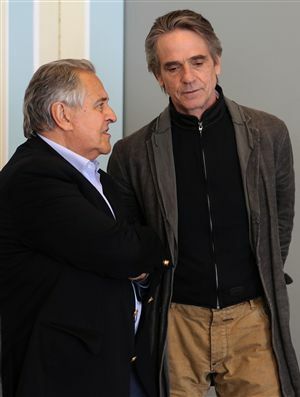 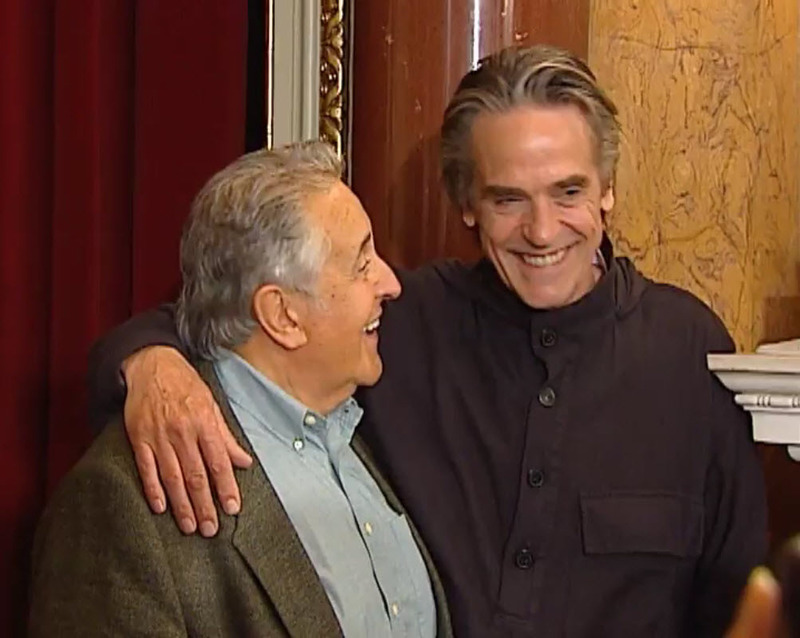 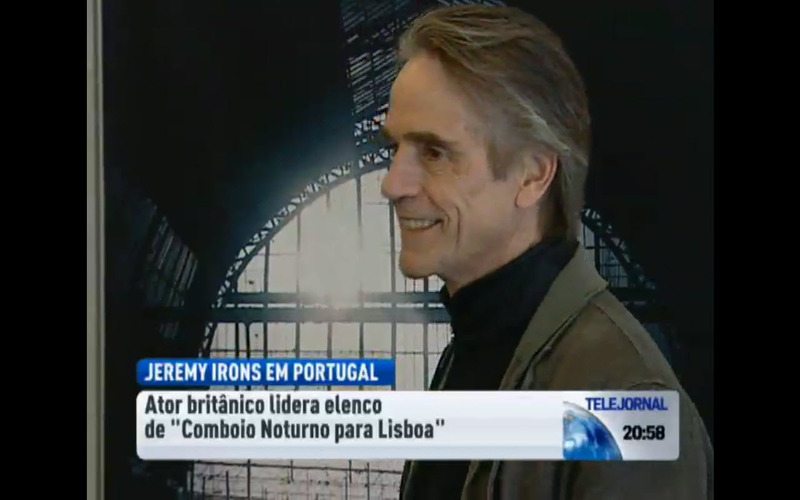 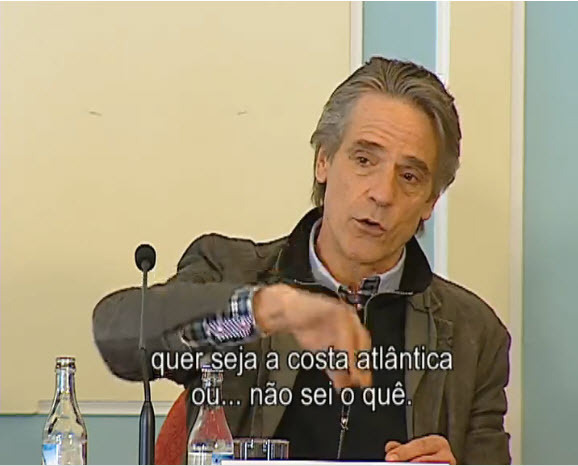 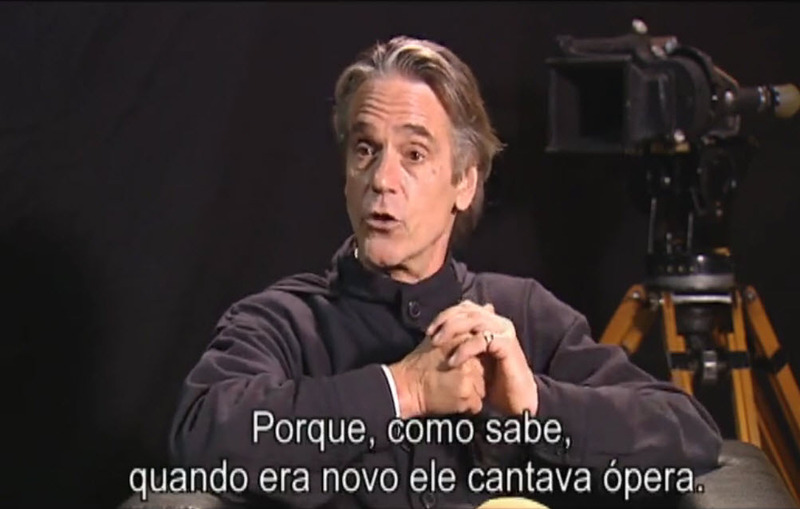 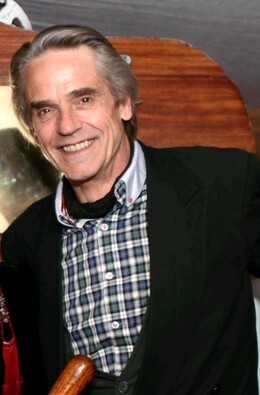 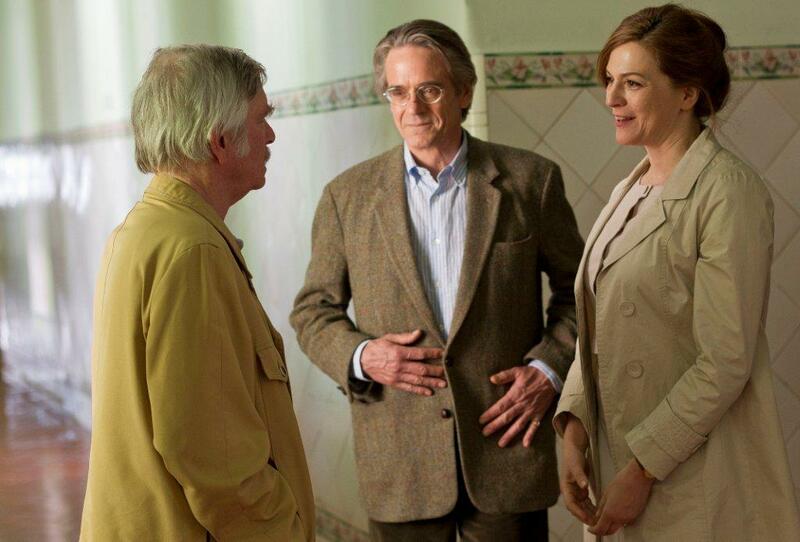 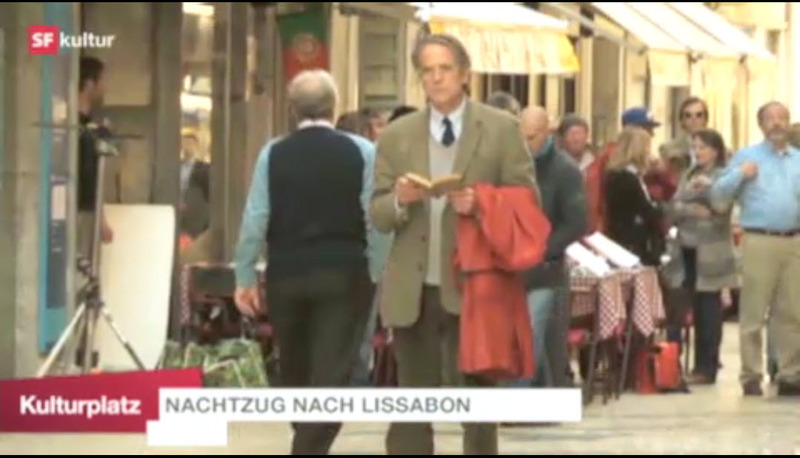 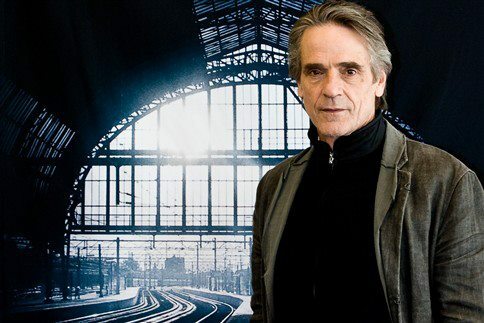 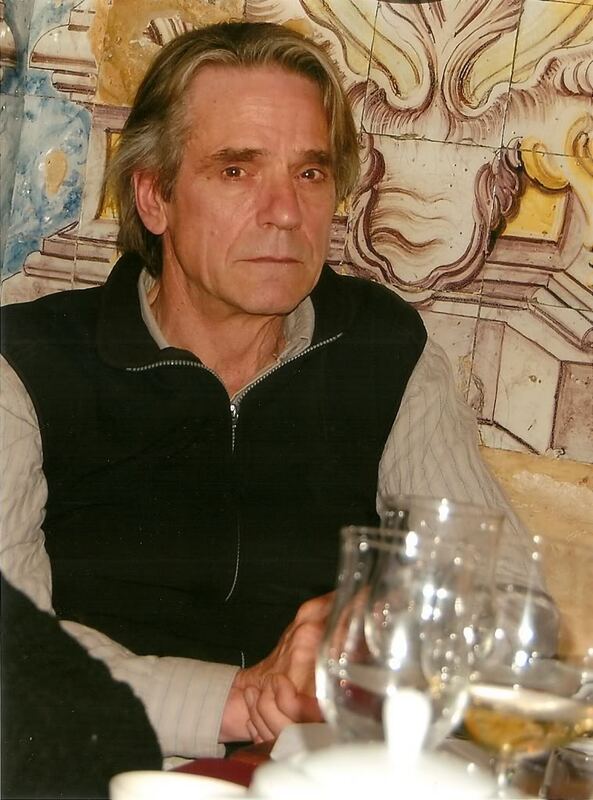 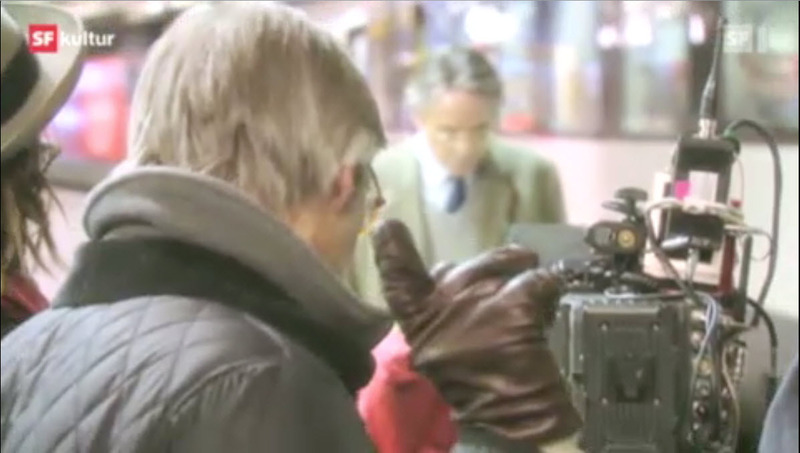 Plays Oscar winner Jeremy Irons, the hero of the novel “Night Train to Lisbon” of Berners Peter Bieri: In the lead role. 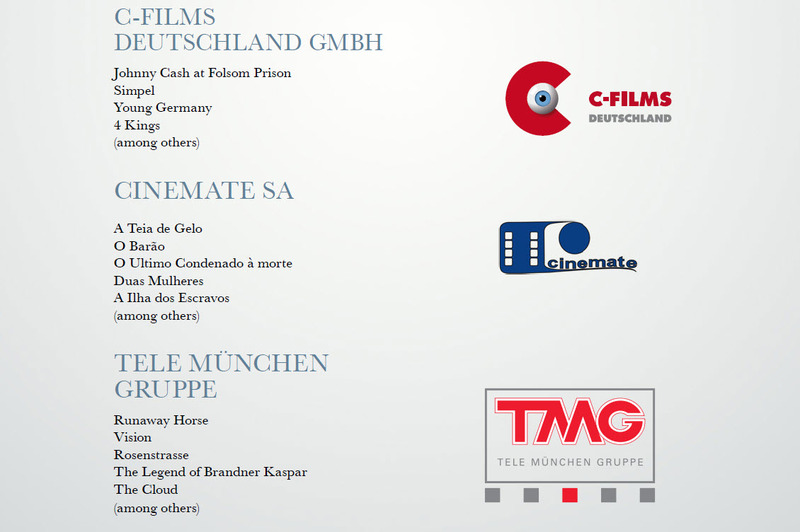 “A film is something of the best that there is an Embassy”, is pleased Mayor Alexander Tschäppät. 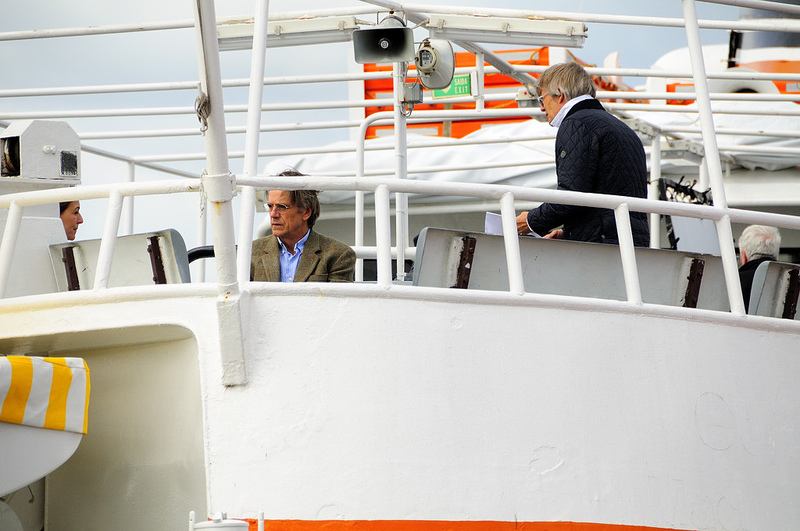 The shooting was half-Berne in operation: police and firefighters blocked for hours from the church-span bridge, Bernmobil led to four lines and the STAPI held on Saturday for the star-studded crew reception: “is absolutely easy Irons. 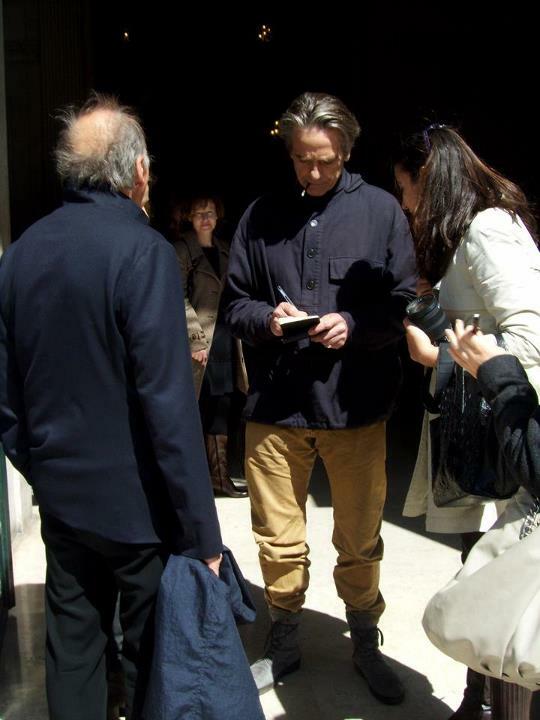 He chatted with everyone and left the hall as one of the last, “says Tschäppät. 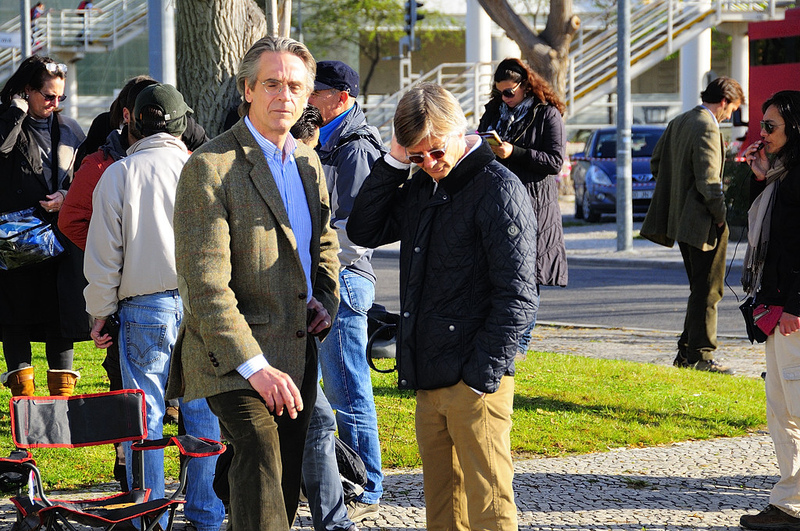 Only the weather was a thorn in the film-makers: instead of pouring rain there was bright sunshine. 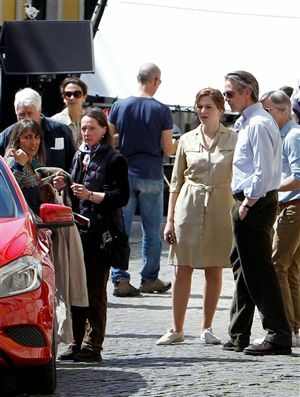 “This must expect every film crew,” said a spokesman on the set. 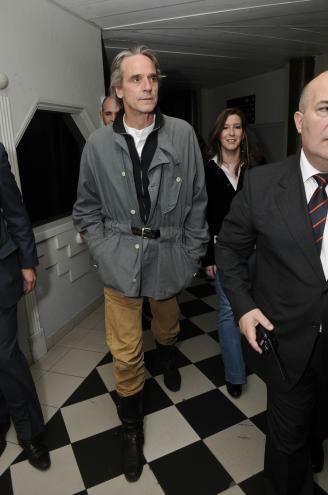 The rain came on again from the rubber hose. 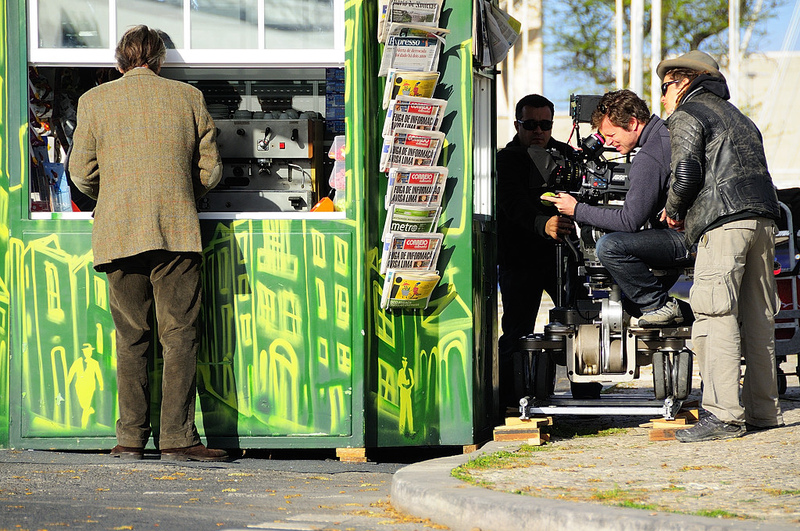 Tomorrow go on the shooting in the Old Town. 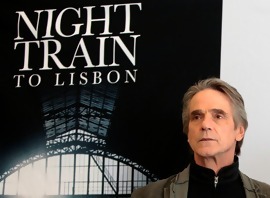 Hollywood on Sunday occupied the Bernese Kirchenfeldbrücke for the film adaptation of the bestselling ‘Night Train to Lisbon “. 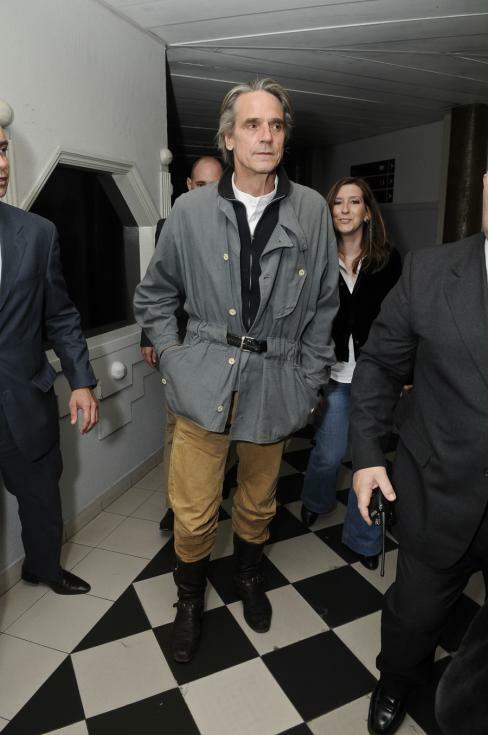 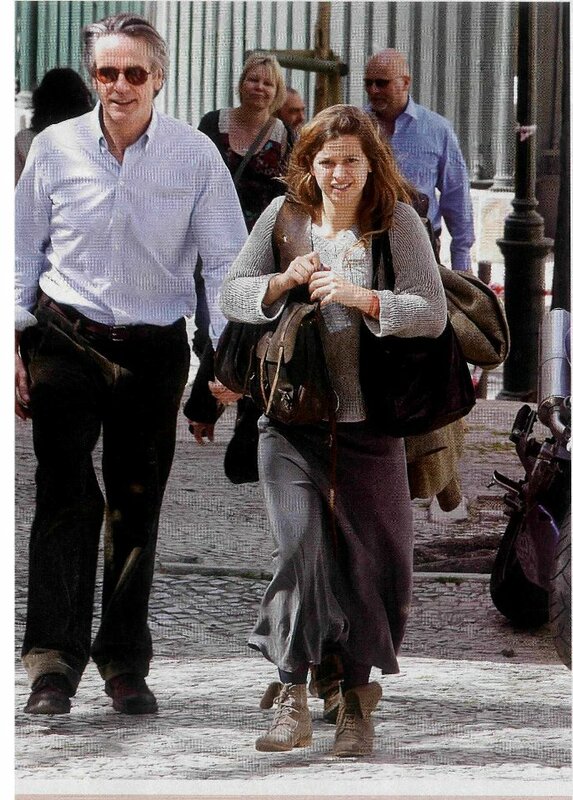 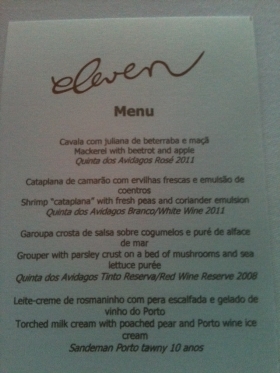 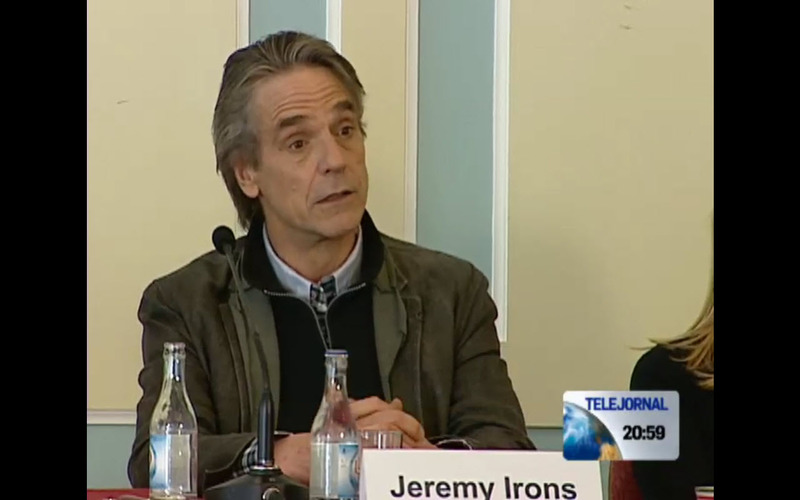 Also included: movie star Jeremy Irons. 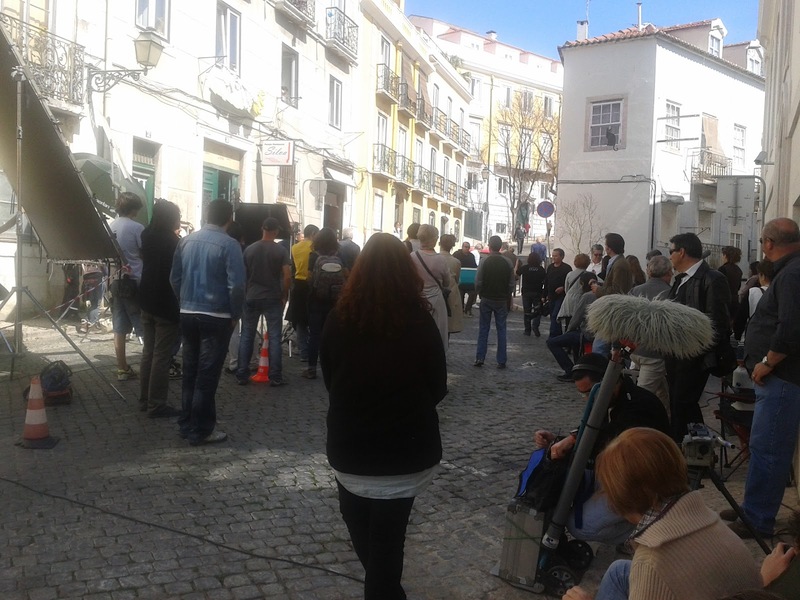 On Sunday, the church-span bridge for pedestrians and public transport is blocked. 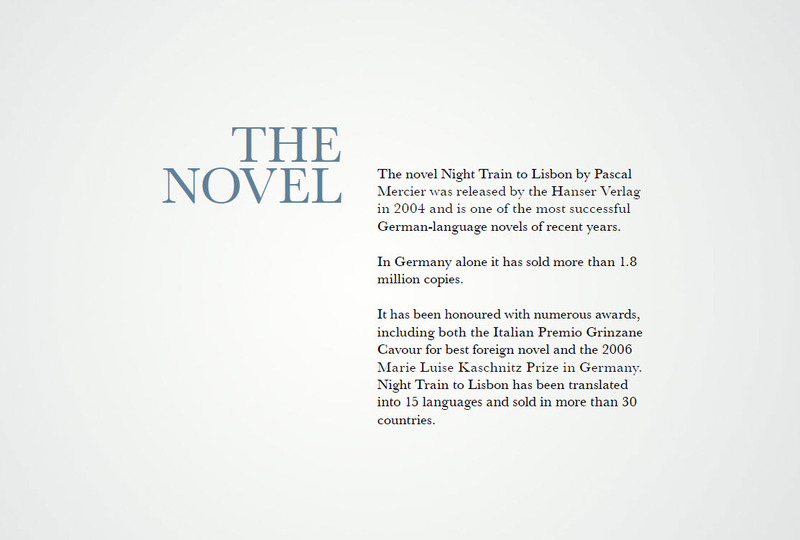 The reason Hollywood makes in the city for the film adaptation of the bestselling ‘Night Train to Lisbon “wide of the Bernese writer Pascal Mercier. 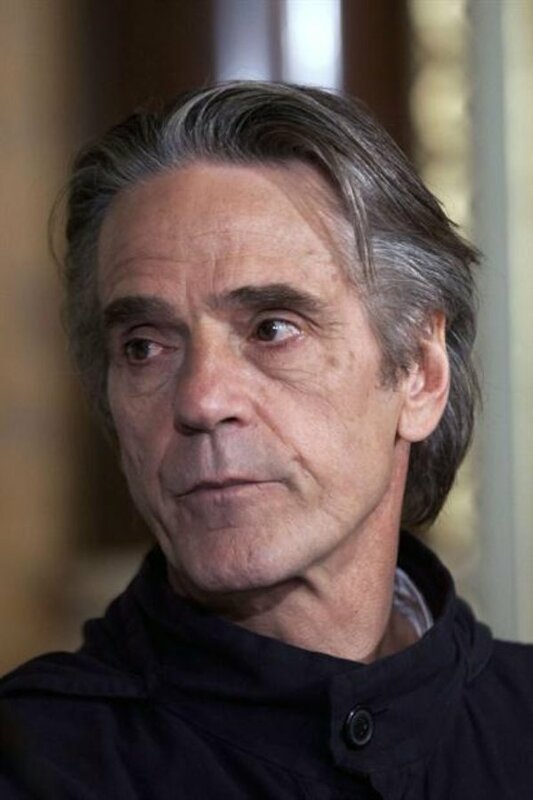 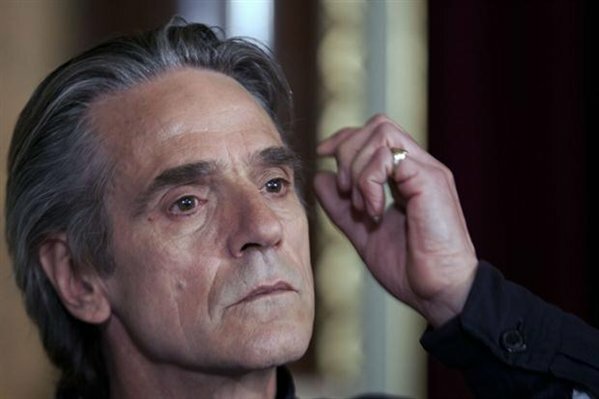 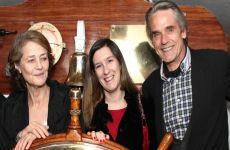 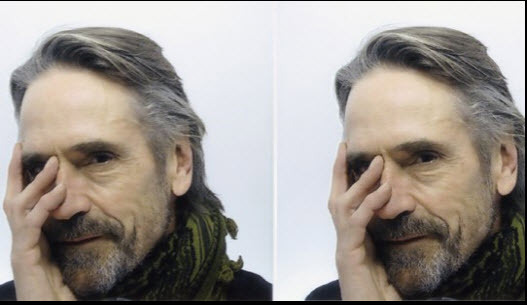 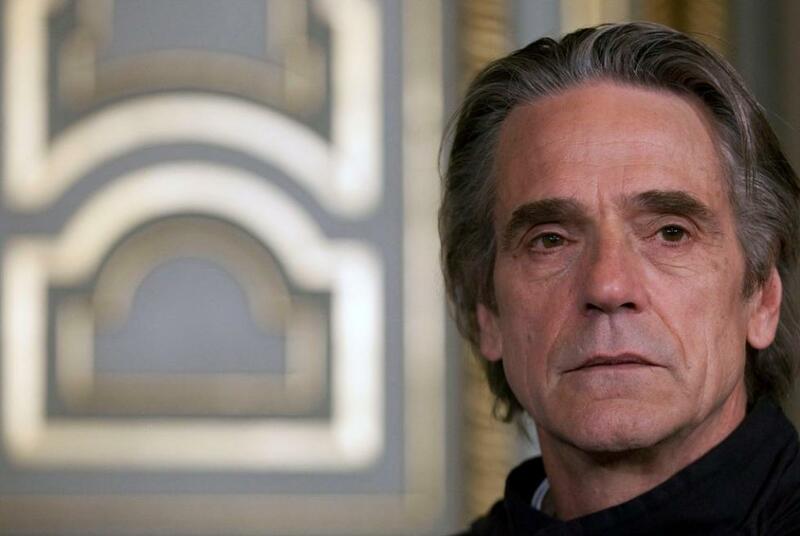 By turning it on is Oscar-winner Jeremy Irons, who lived as a Latin teacher Raimund Gregorius that fateful encounter with an alleged suicide at the church-span bridge that will put his life on its head. 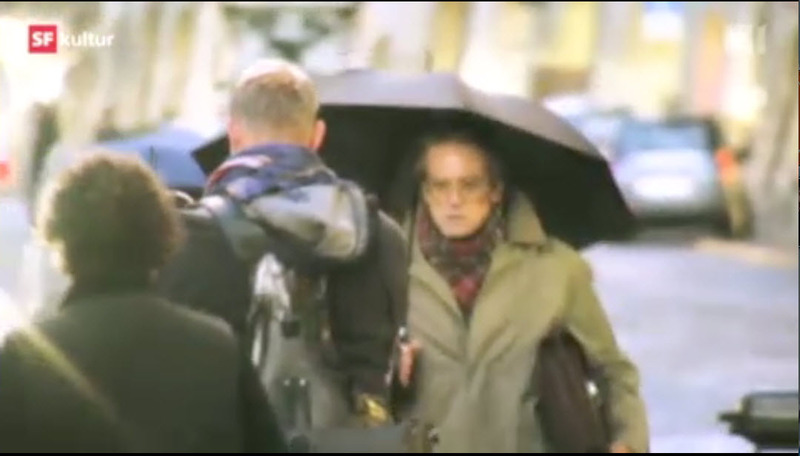 Irons plays the leading role, originally was scheduled for Geoffrey Rush. 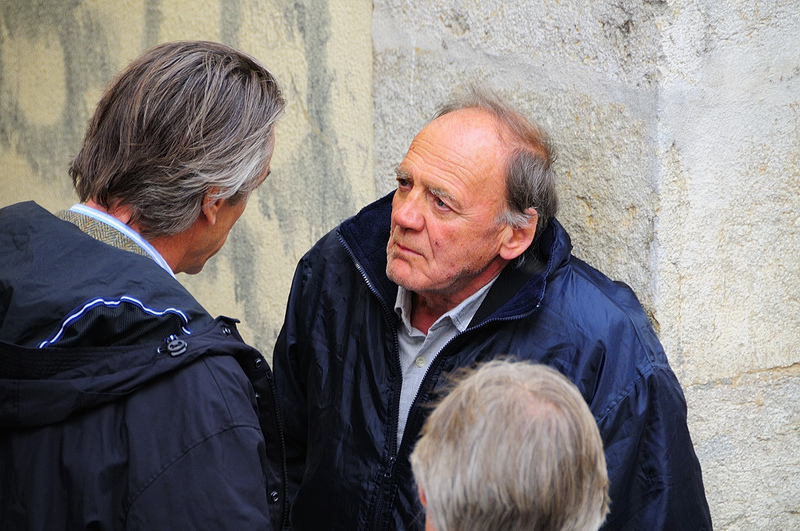 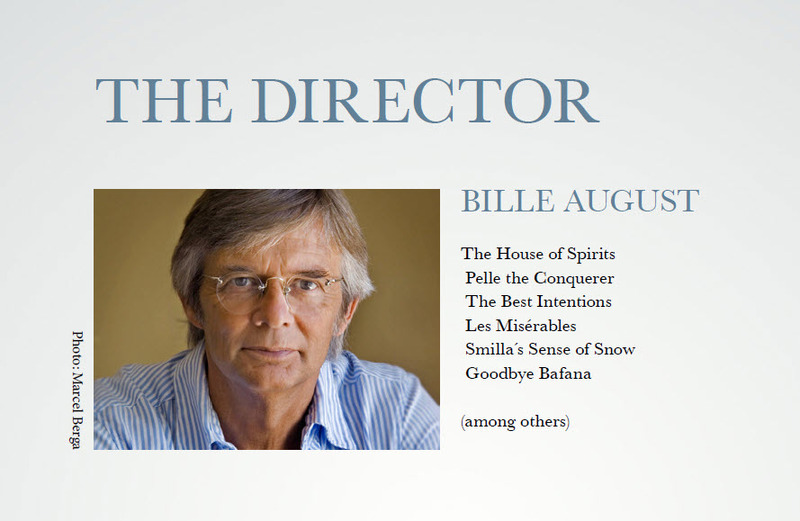 The Danish director Bille August (“Pelle the Conqueror”) takes over the film. 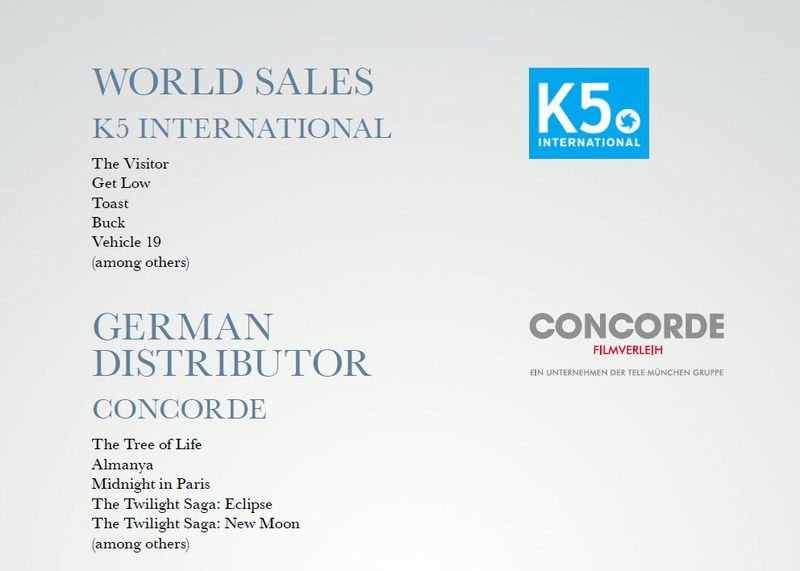 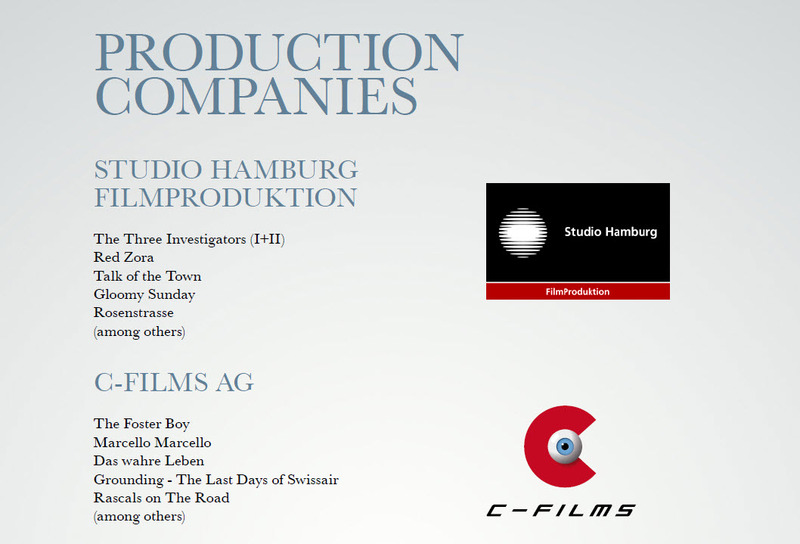 The budget of the production is 7.5 million €. 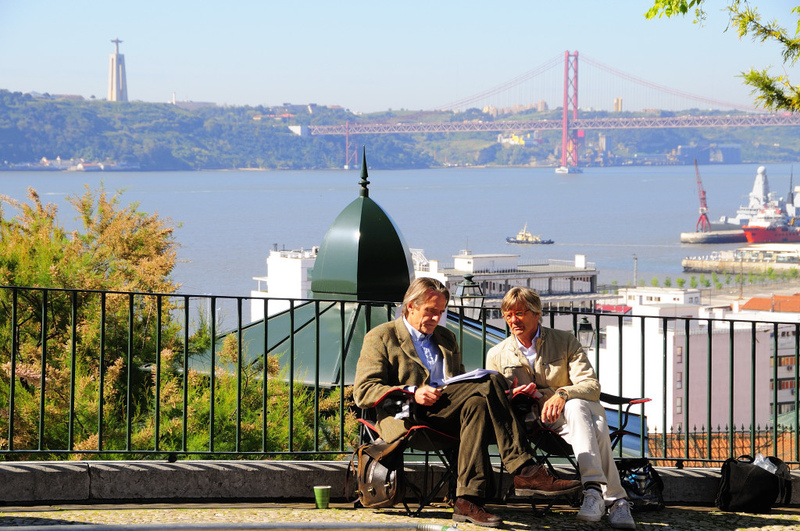 The church-span bridge is closed until Sunday night by 20 clock. 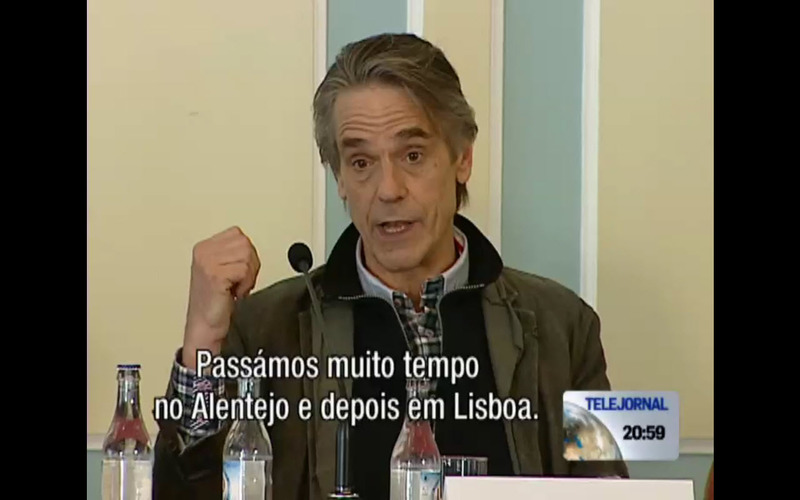 The trams and buses will be rerouted. 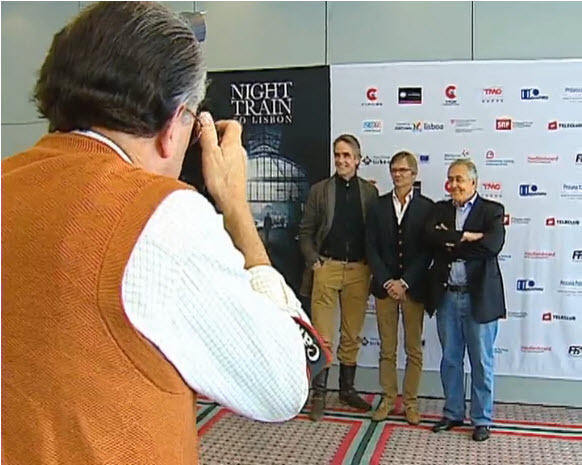 The successful novel, “Night Train to Lisbon” of lecturing in Germany Berne writer Peter Bieri aka Pascal Mercier is filmed partly in Bern. 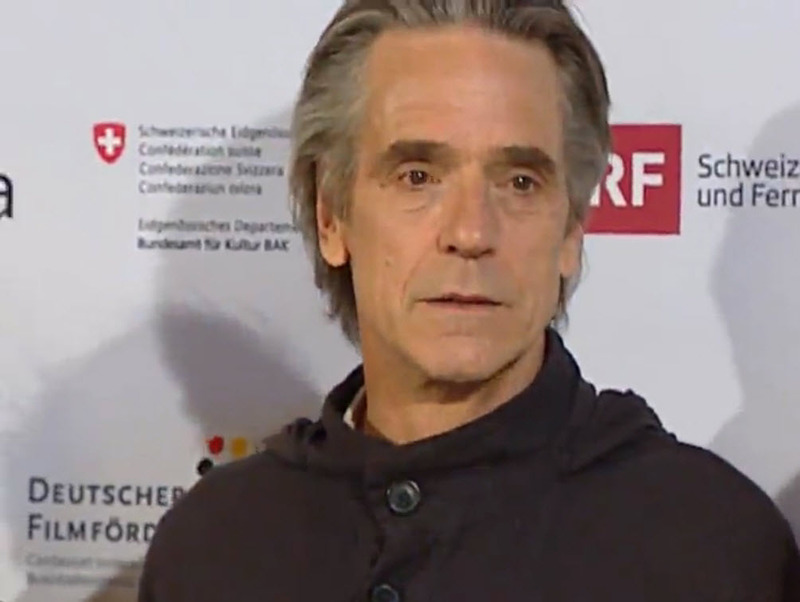 “The school and church field Kirchenfeldbrücke will also play an important role in the film,” executive producer Peter Reichenbach says of the Zurich company C film. 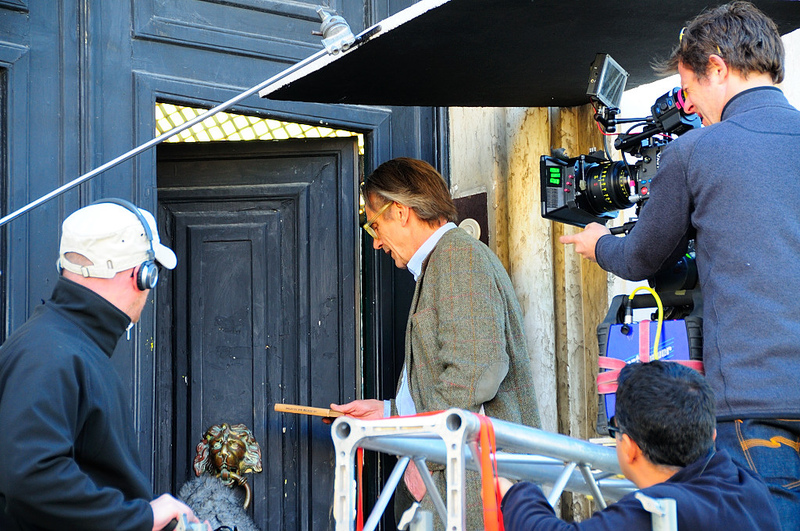 Filming will take place in late February / early March 2012. 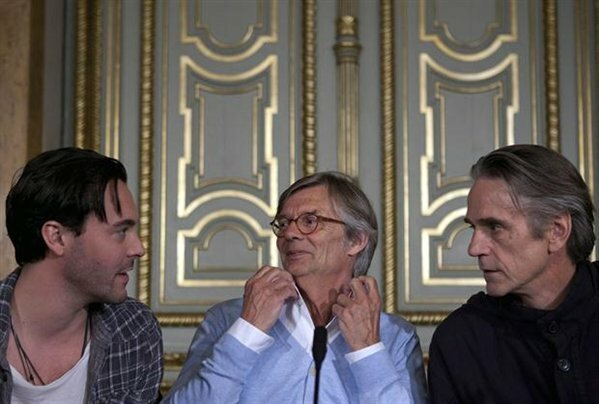 The week after next will examine the Danish director Bille August (“Pelle the Conqueror”) and his team have several locations in the federal city, which for the rotation are eligible, says Reichenbach. 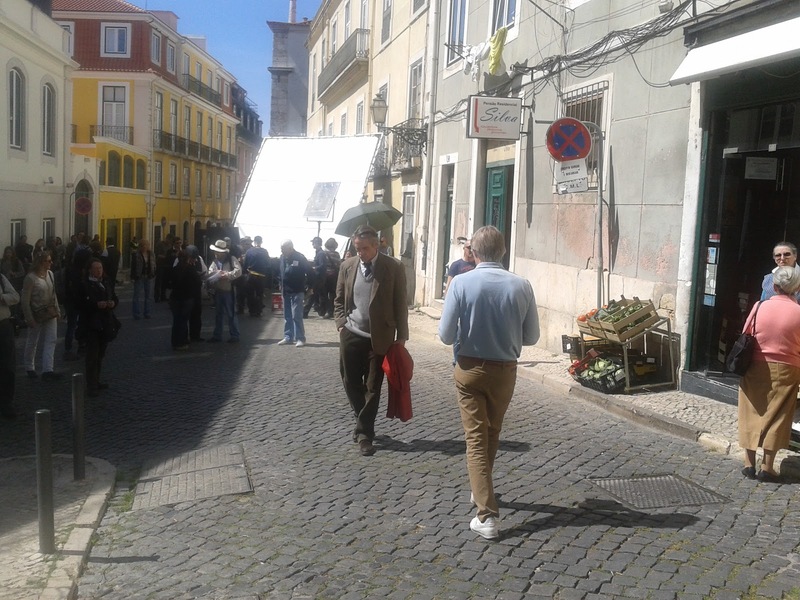 The end of June this year, the producer left open whether the opening sequences of the 7.5-million-euro project will actually filmed in the federal capital. 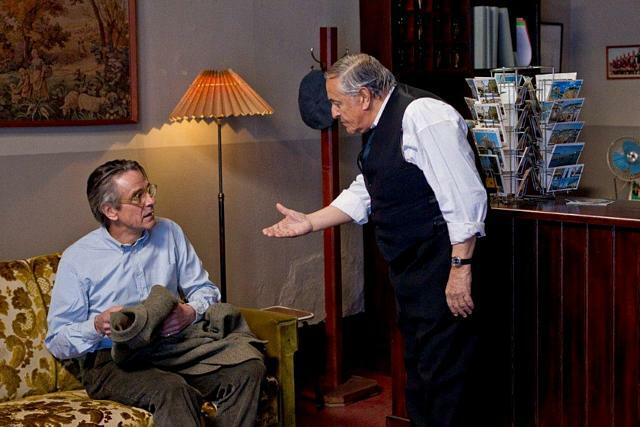 For the lead role was originally Geoffrey Rush (“The King’s Speech”) are provided. 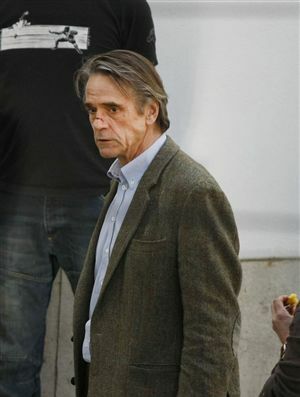 Now Oscar-winner Jeremy Irons (62) experience as a Latin teacher Raimond Gregory that fateful encounter with an alleged suicide at the church-span bridge that will put his life on its head. 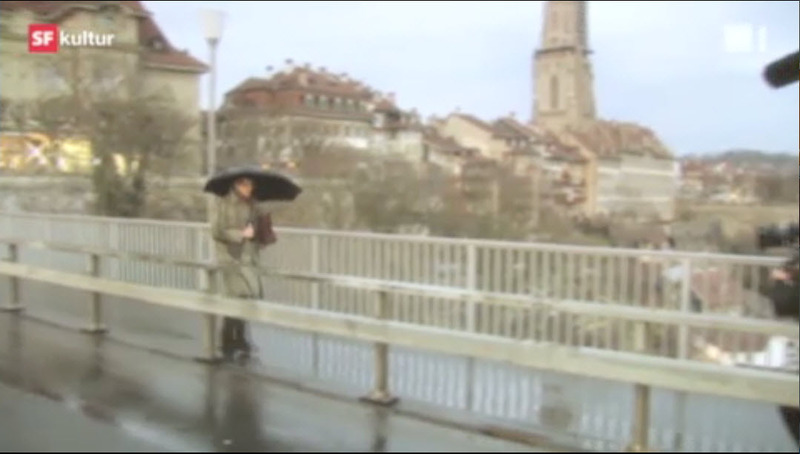 Beside the church-span bridge and the same high school are also the main station Bern as well as a bookshop and a private apartment in the Old Town as provided locations. 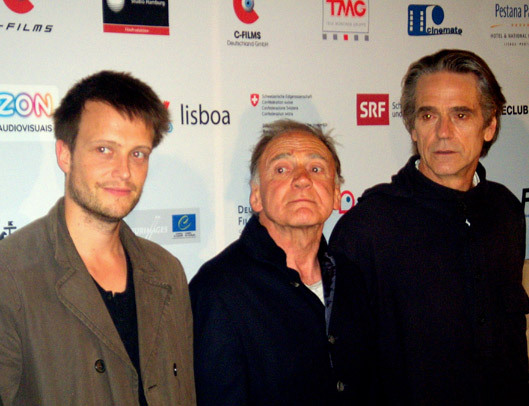 The film is also playing in the Stars, Bruno Ganz and Vanessa Redgrave will come but not in the federal city in action. 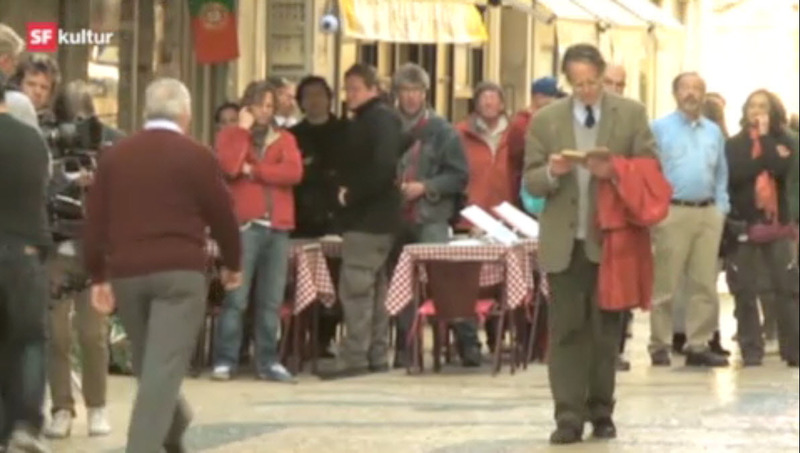 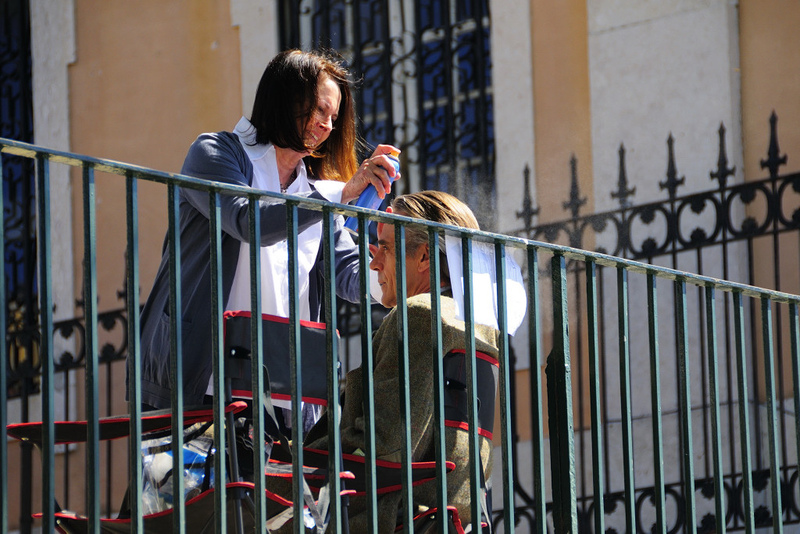 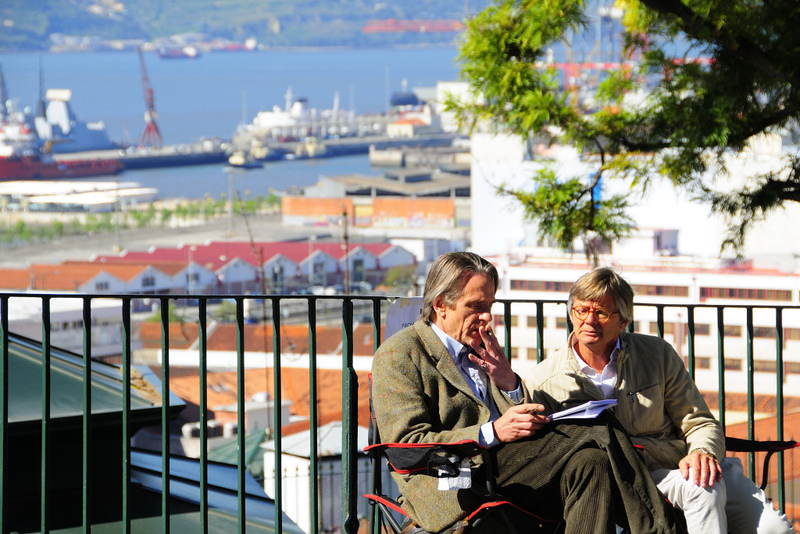 “Because of their roles, they occur only in Portugal before the camera,” says Reichenbach. 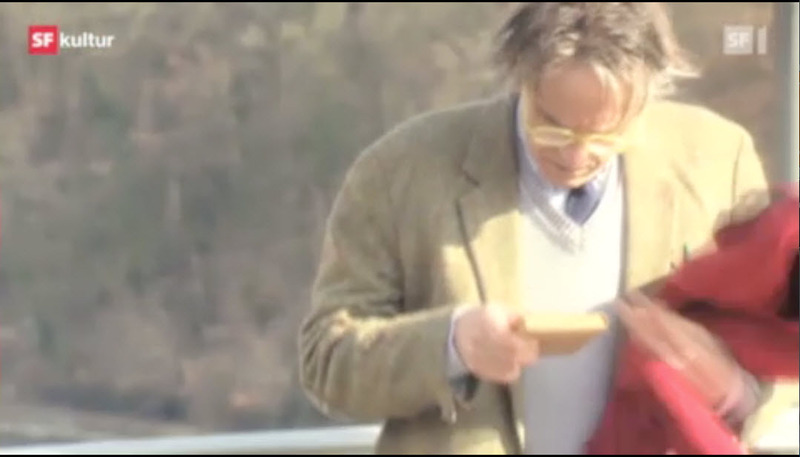 The Bernese, “location scout” for the production Renatus Mauderli. 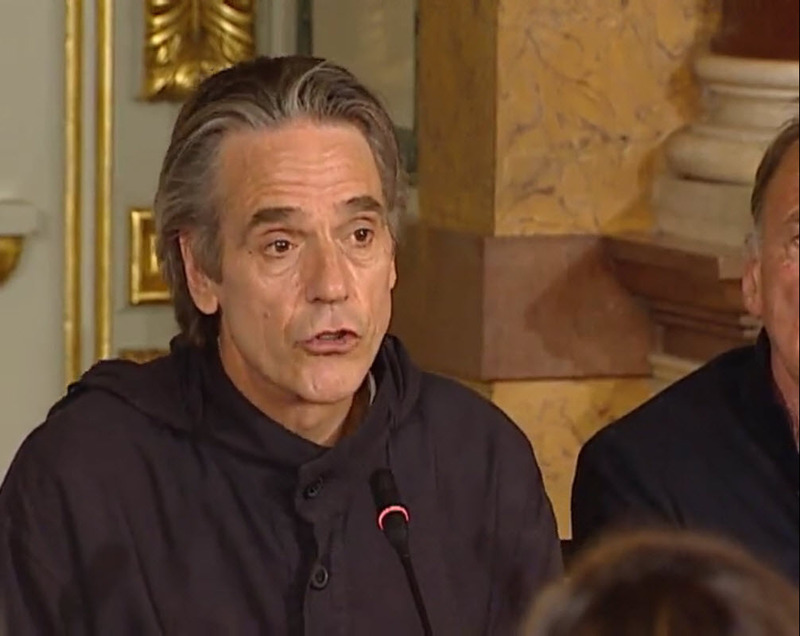 He clarifies these days, which the bookstore and housing which are eligible as locations. 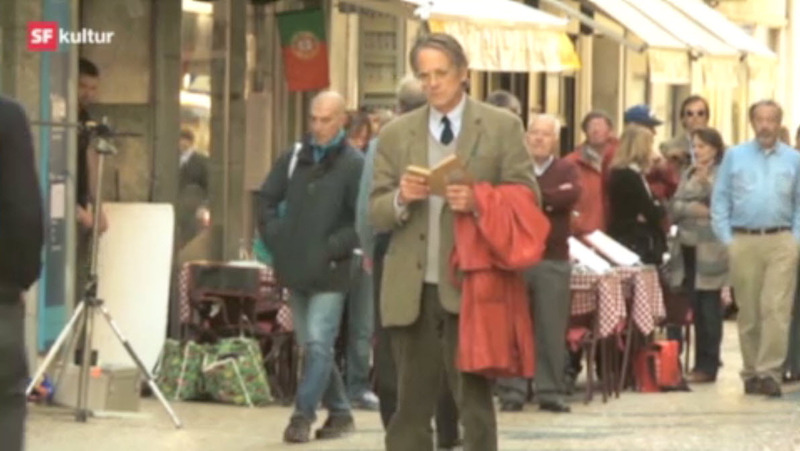 The Bookshop on the Iberian Hirschengraben, in a work that writer Gregory joins, whose life he seeks to trace in Lisbon, there is no longer a business with its own window. 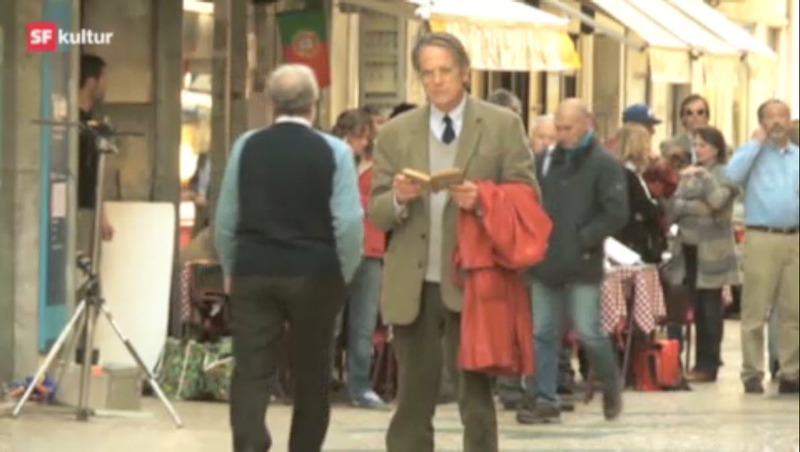 Mauderli therefore had to start looking and has a total of seven bookstores found appropriate, would make their owners for their location shooting available. 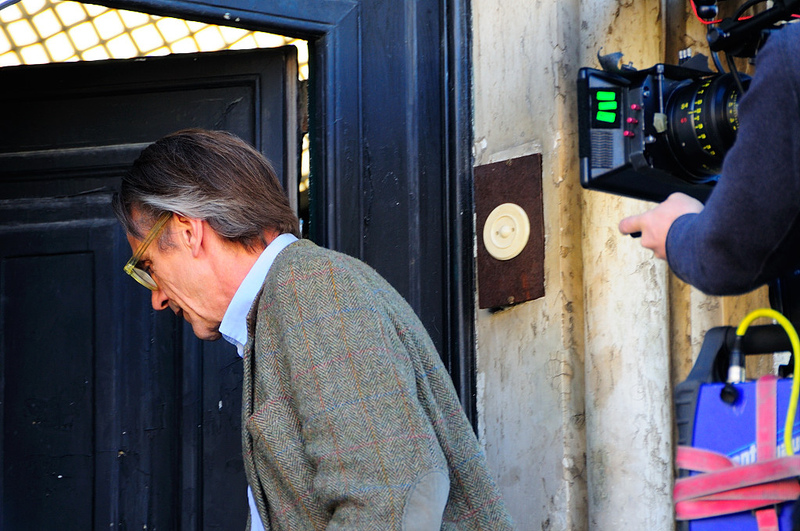 Slightly more difficult, the search for an old apartment that could easily pass as the Bern home of Gregory. 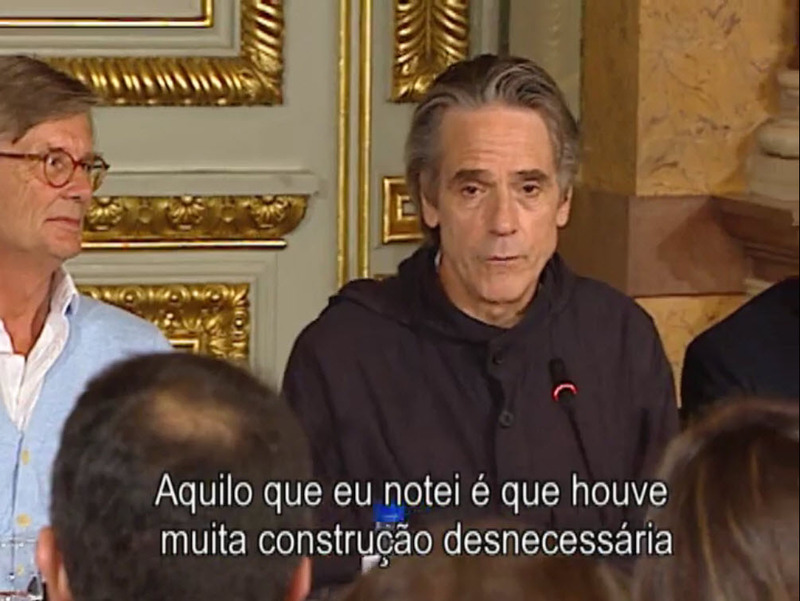 “The residents have to be prepared for some inconvenience.” So it would be about ready to move during the filming of the hotel, says Mauderli. 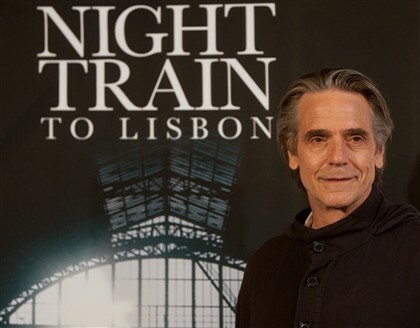 From 19 March the Danish filmmaker who filmed around here part of “The House of the Spirits” in the ’90s, returns to film “Night Train to Lisbon,” the adaptation of the bestselling novel by Pascal Mercier, Jeremy Irons and Charlotte Rampling. 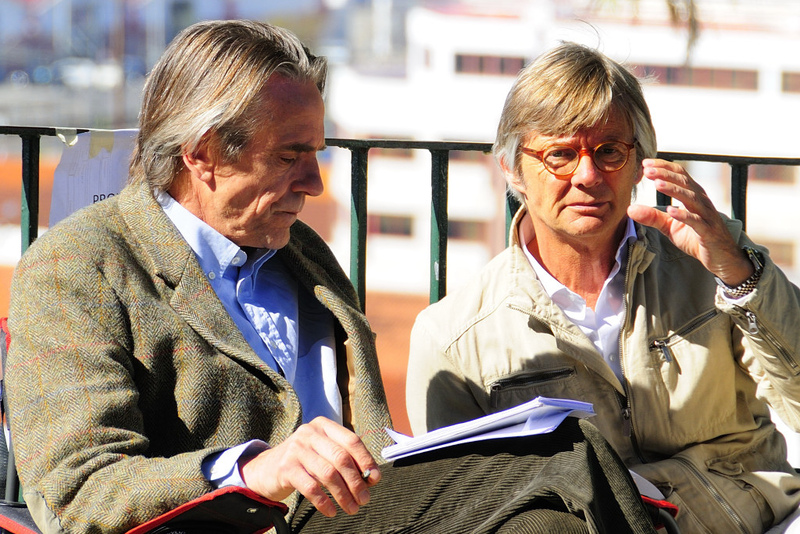 Bille August, director of “The House of the Spirits”, film adaptation of the novel by Isabel Allende, will return to Portugal to shoot. 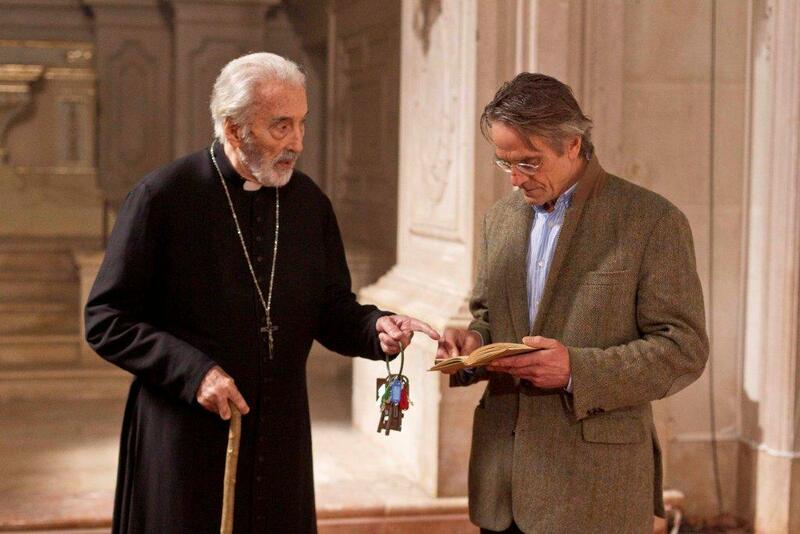 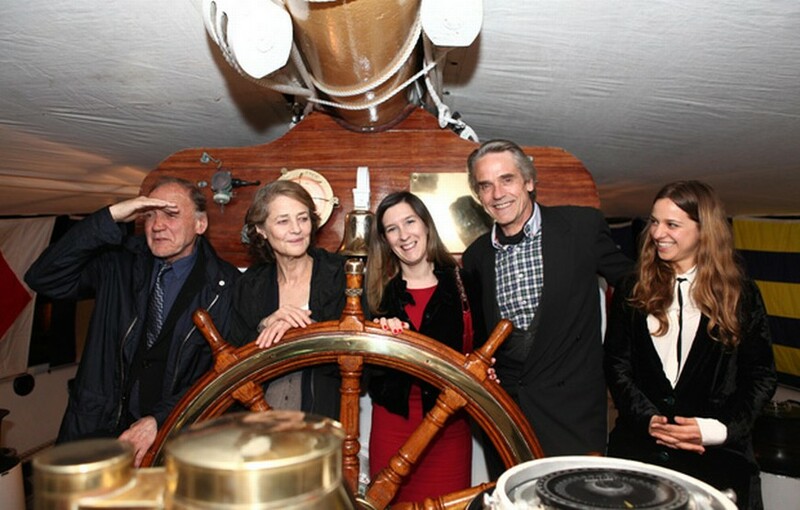 And it brings the actors Jeremy Irons, Charlotte Rampling, Christopher Lee and Bruno Ganz. 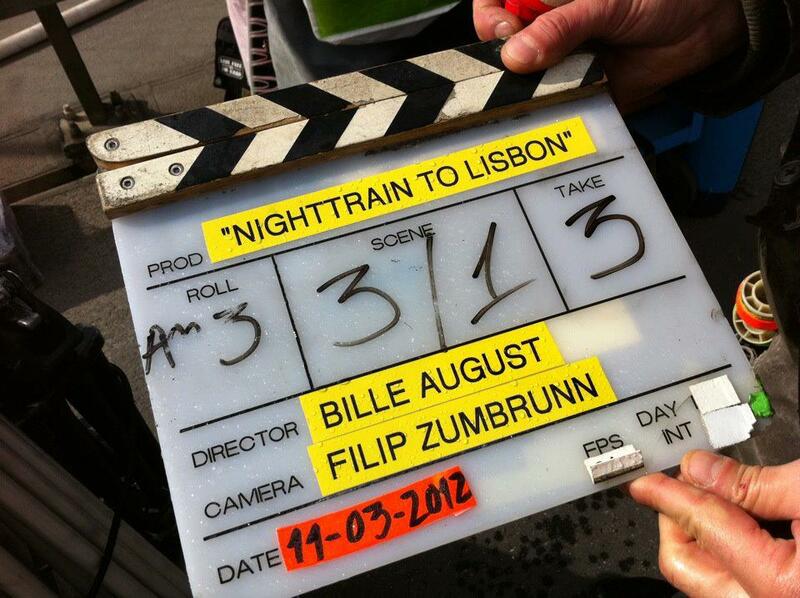 The Danish filmmaker begins tomorrow in Bern, Switzerland, shooting the film “Night Train to Lisbon”. 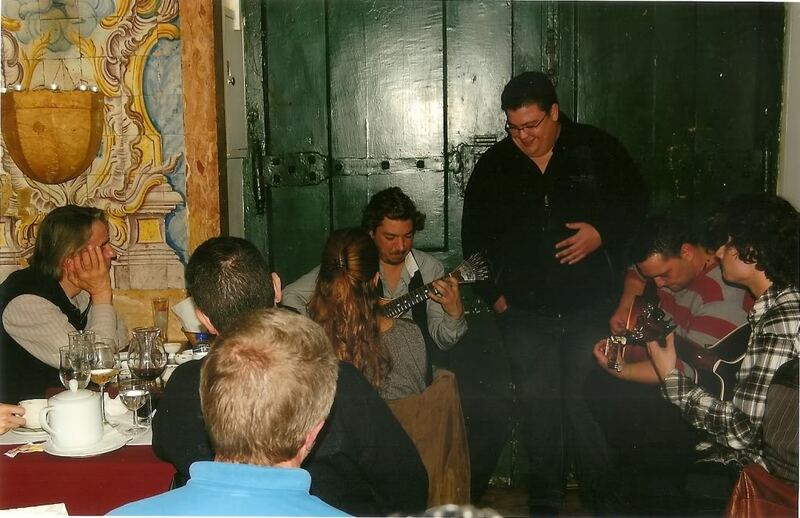 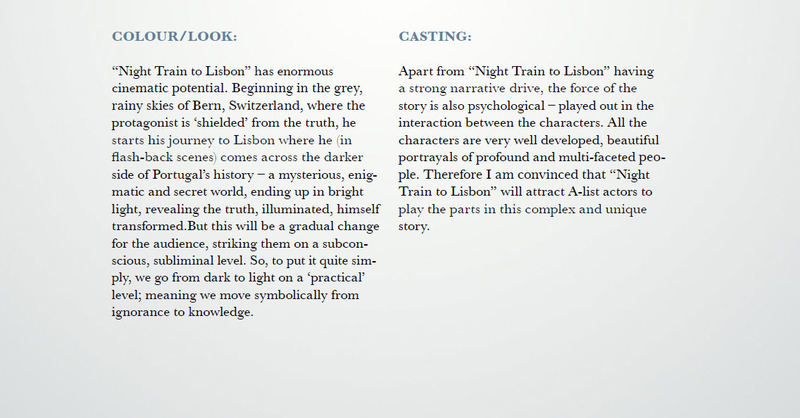 From 19 March the team will be filming in Lisbon, told Lusa Portuguese co-producer, Paul Trancoso. 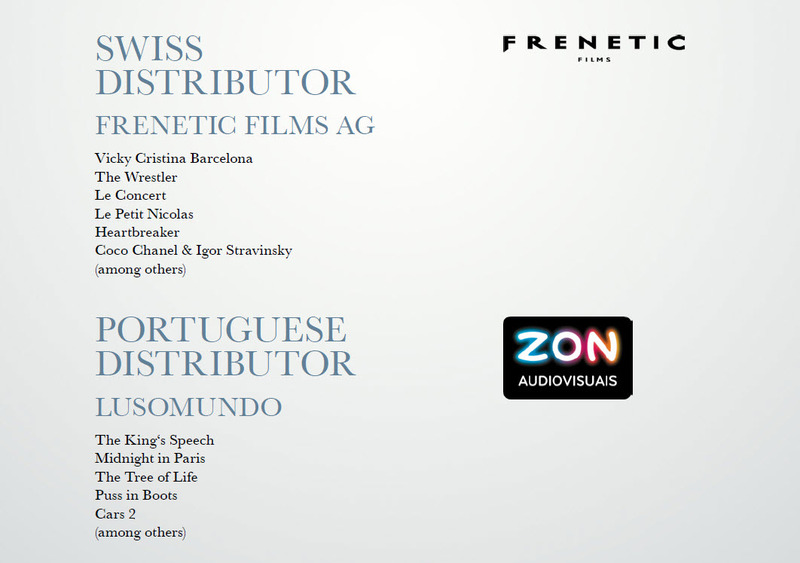 Nicholas Breyner, Adriano Luz, Beatriz Batarda, Philip Vargas and director Joaquim Leitão are some of the Portuguese players entering the fime. 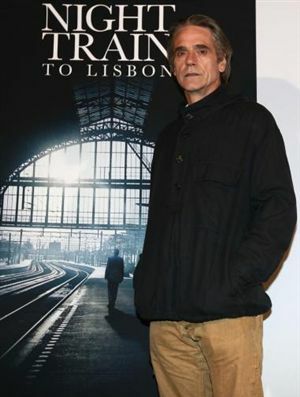 “Night Train to Lisbon” is a co-production between Portugal, Germany and Switzerland and has a budget of eight million. 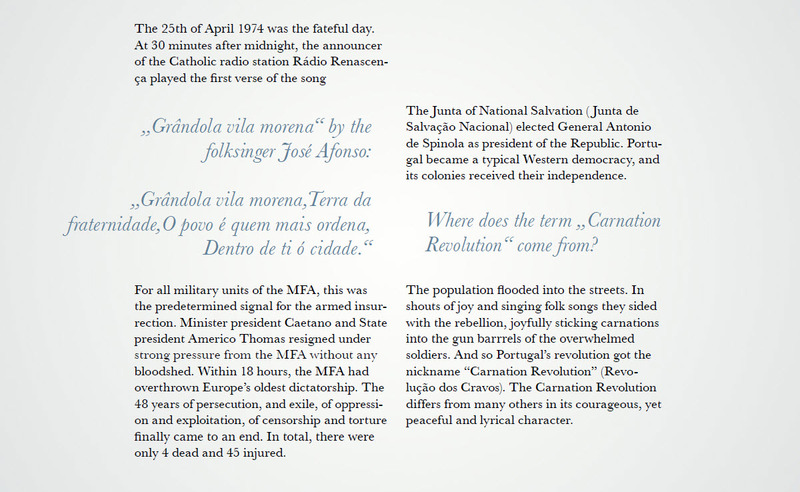 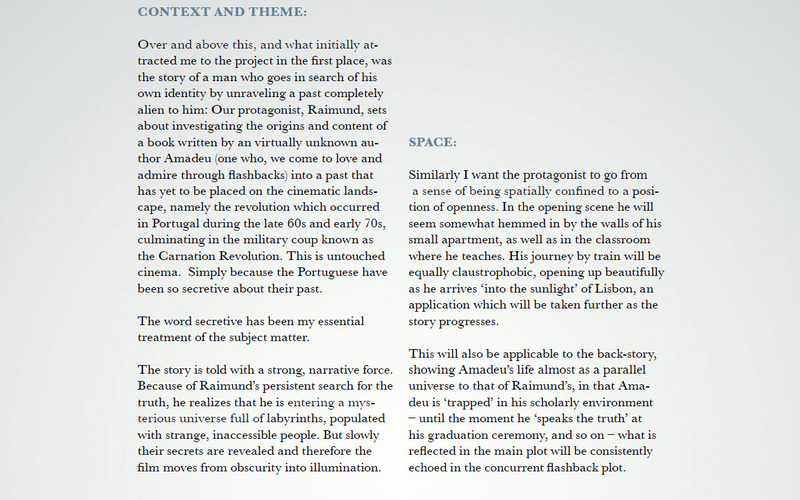 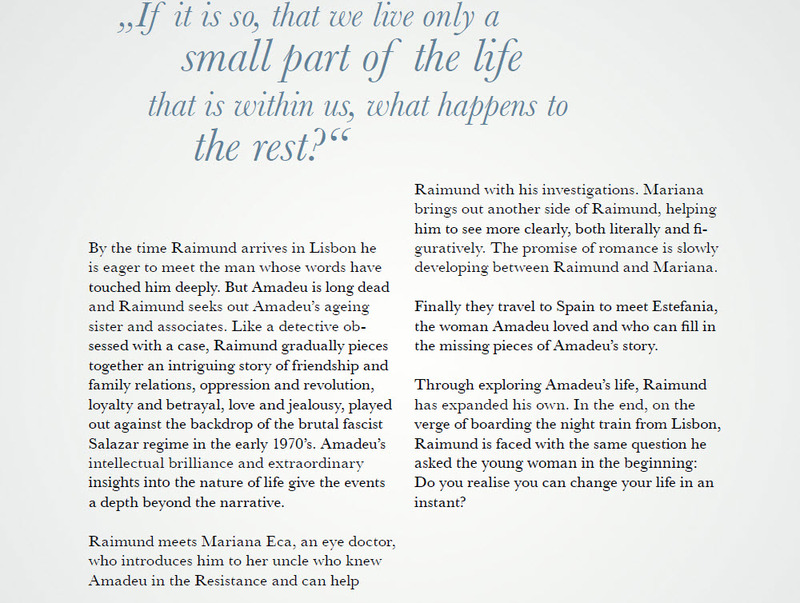 The book by Pascal Mercier, pseudonym of Peter Bieri, a philosophy professor at the University of Berlin, tells the story of a Swiss professor who, after meeting a Portuguese woman, moves to Lisbon to follow the path of Amadeu de Prado, a physician and poet who fought against the dictatorship of the Estado Novo. 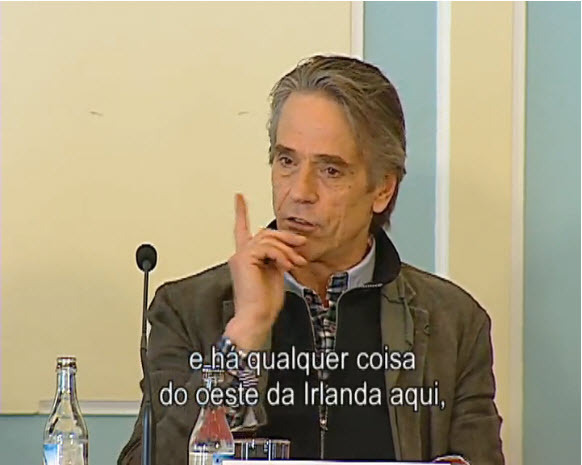 At that time, Paul Trancoso read the novel and realized that the plot “could lead Lisbon to the world,” he told Lusa. 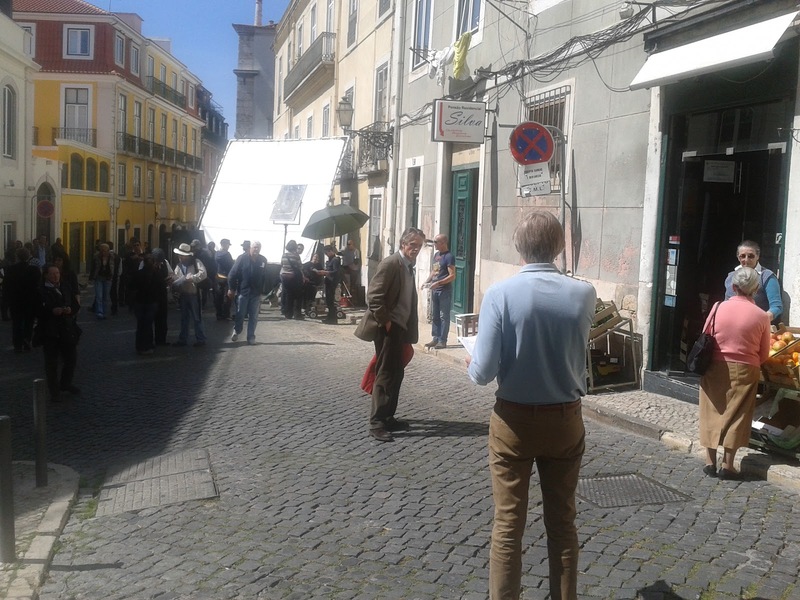 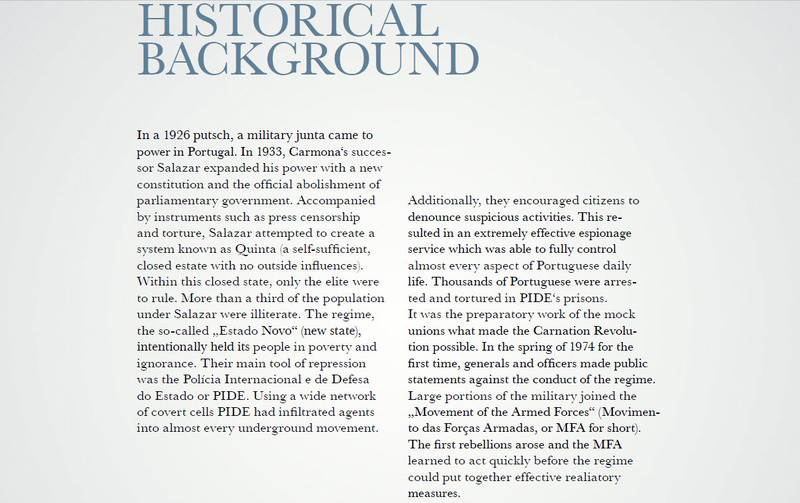 Portuguese then contacted the publisher who published the book, Don Quixote, “to see if the film rights would be free” and then made known to the Swiss producer, involved in making the movie, Portuguese interest in participating in a possible co-production. 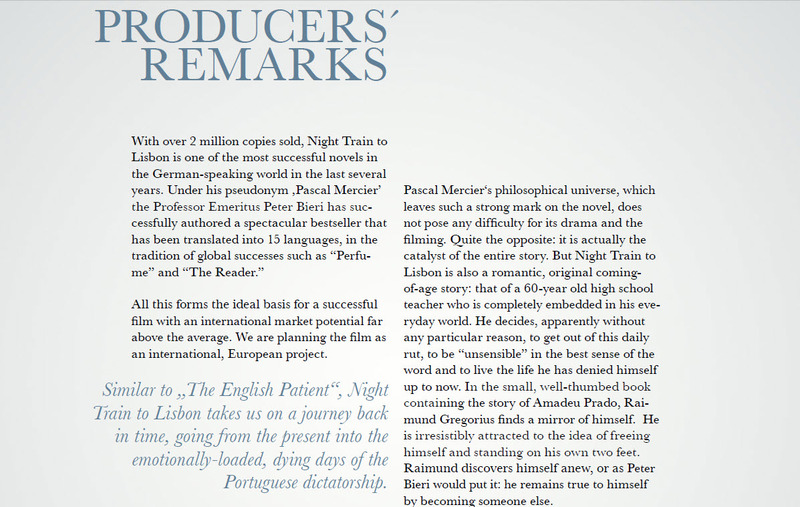 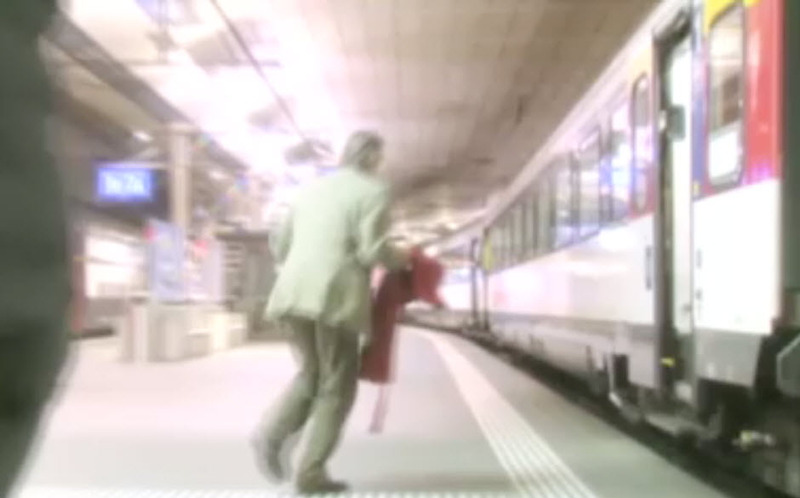 Hollywood is a guest in Bern – thanks to the film adaptation of Pascal Mercier’s bestseller, “Night Train to Lisbon”. 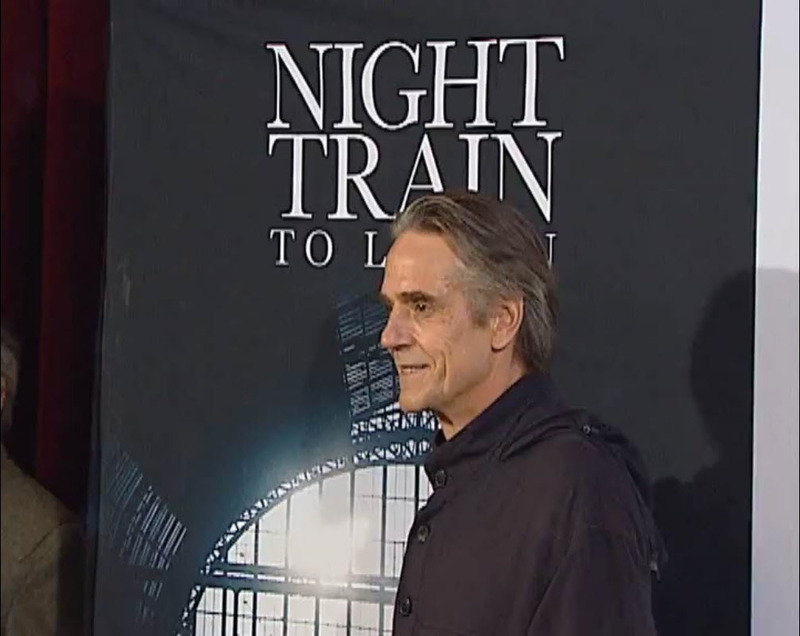 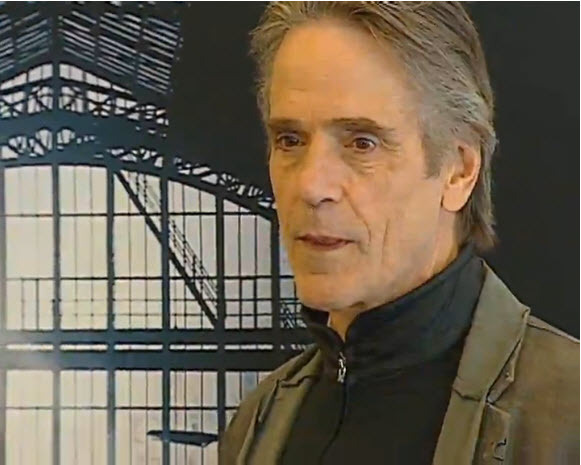 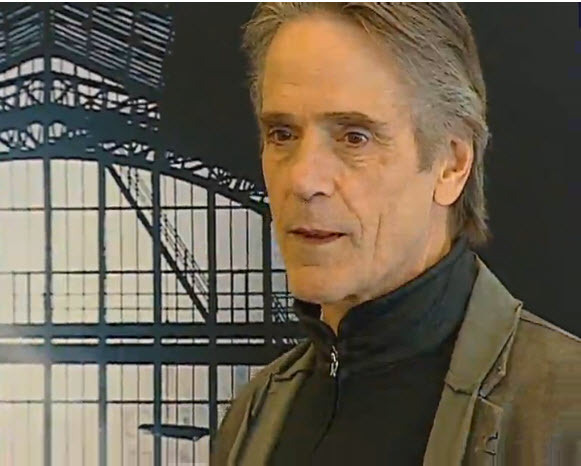 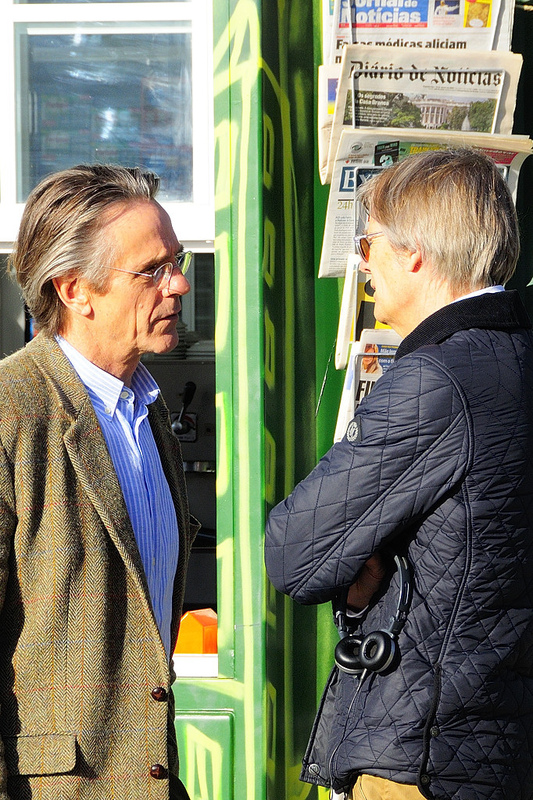 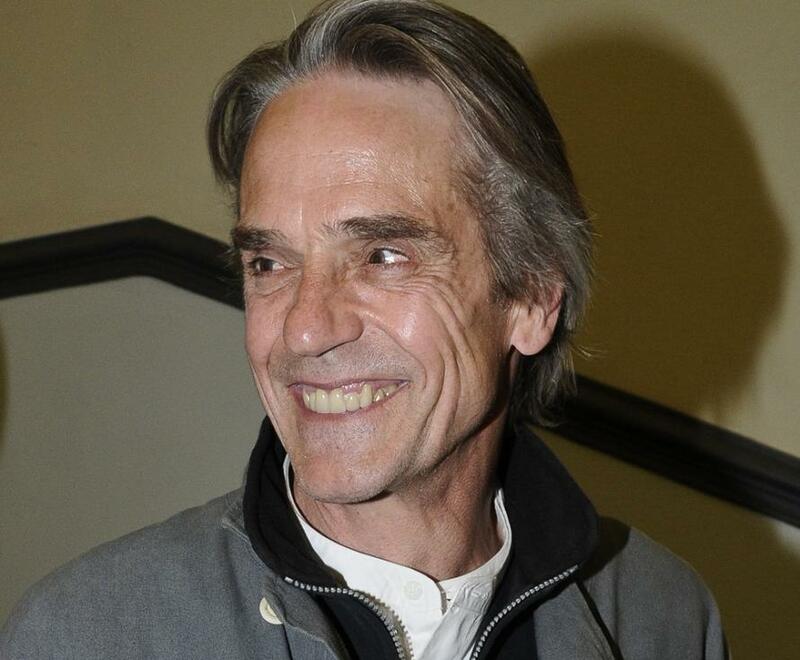 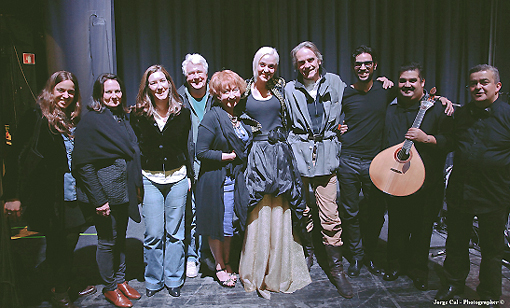 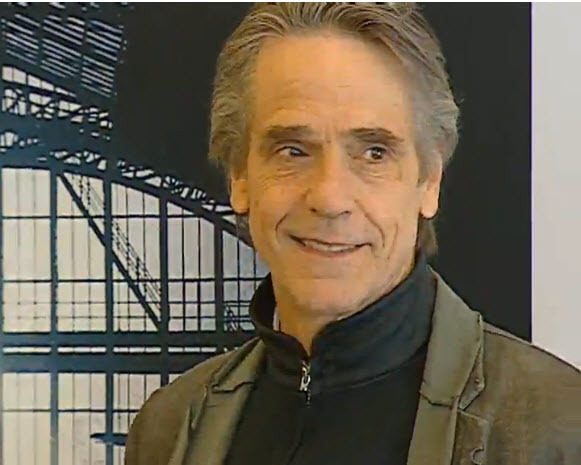 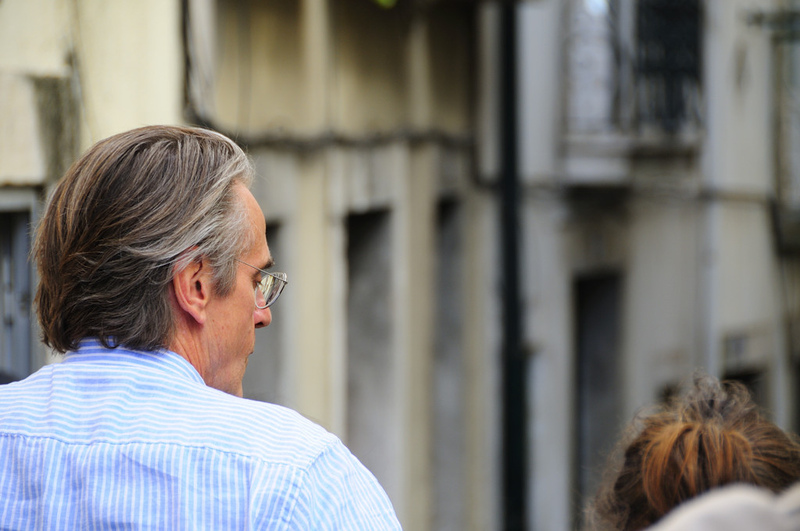 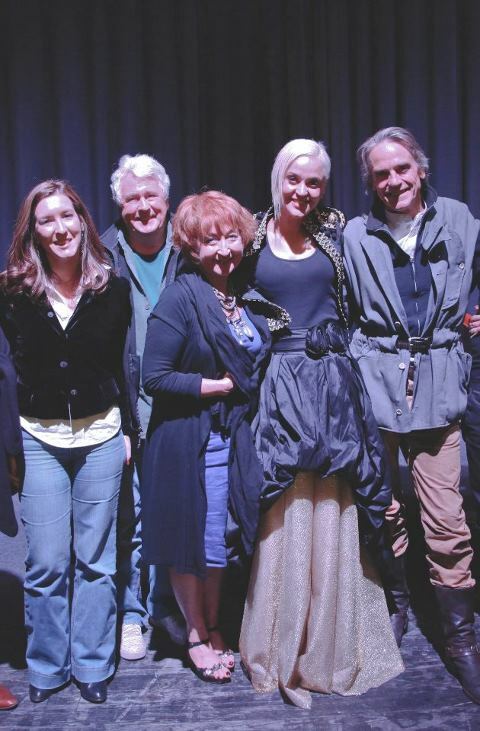 Oscar winner Jeremy Irons praised the city unduly. 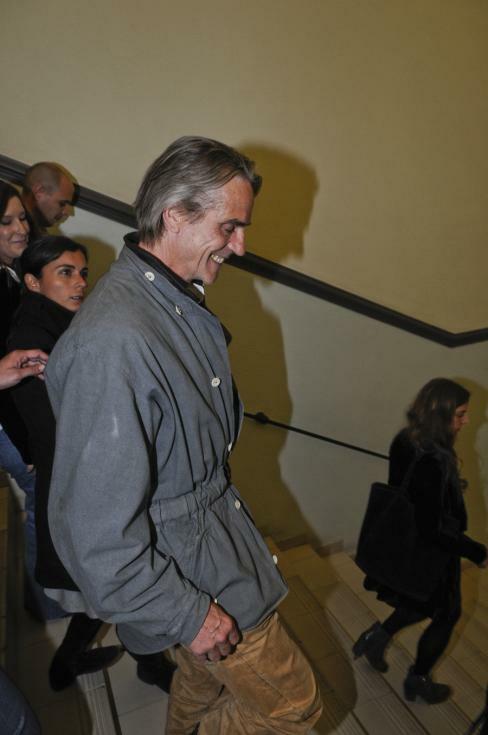 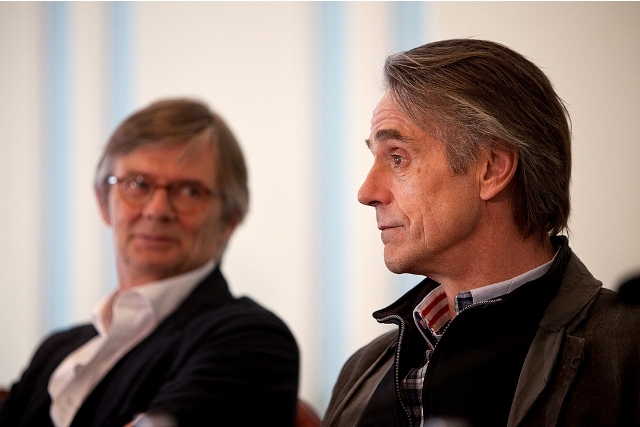 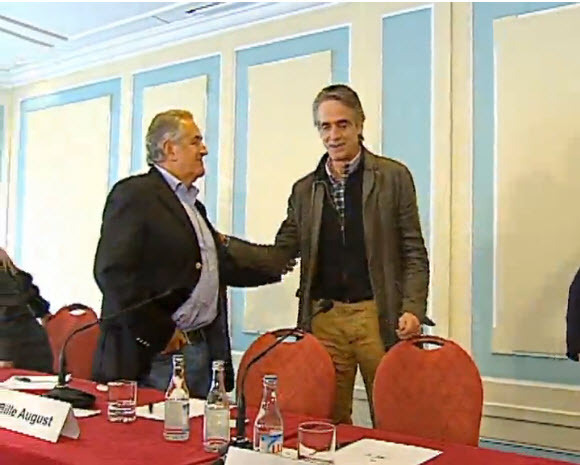 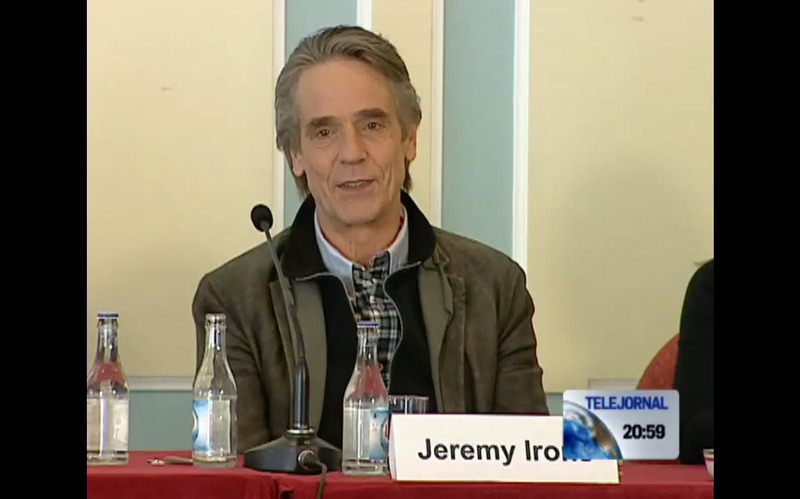 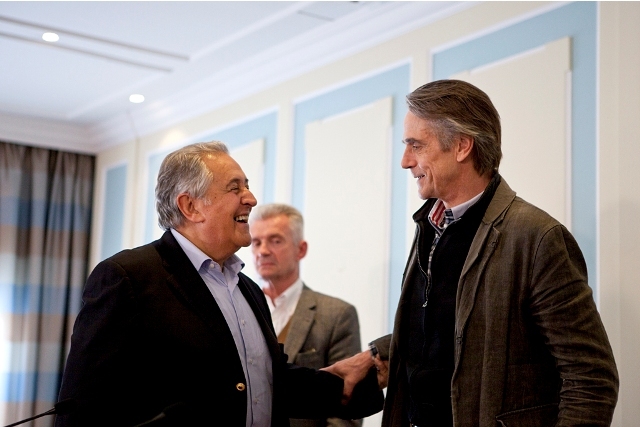 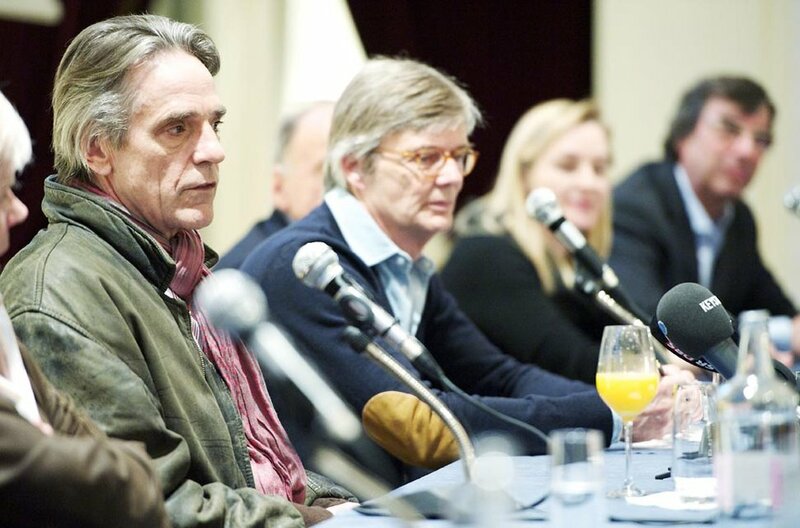 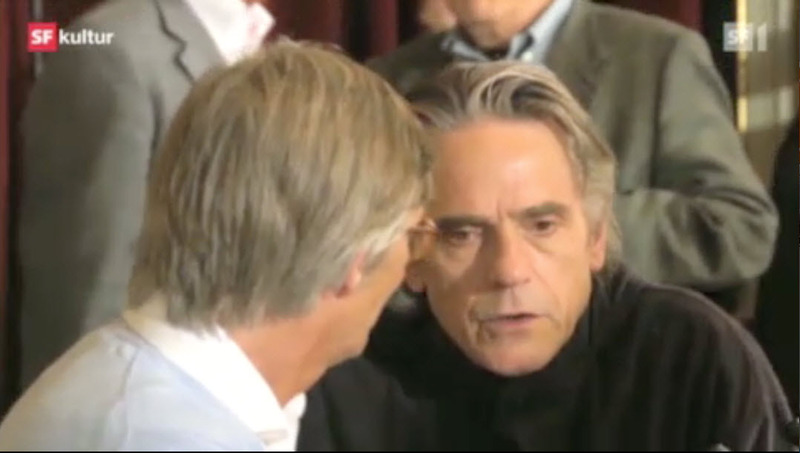 Since Sunday turned Oscar winner Jeremy Irons in Bern. 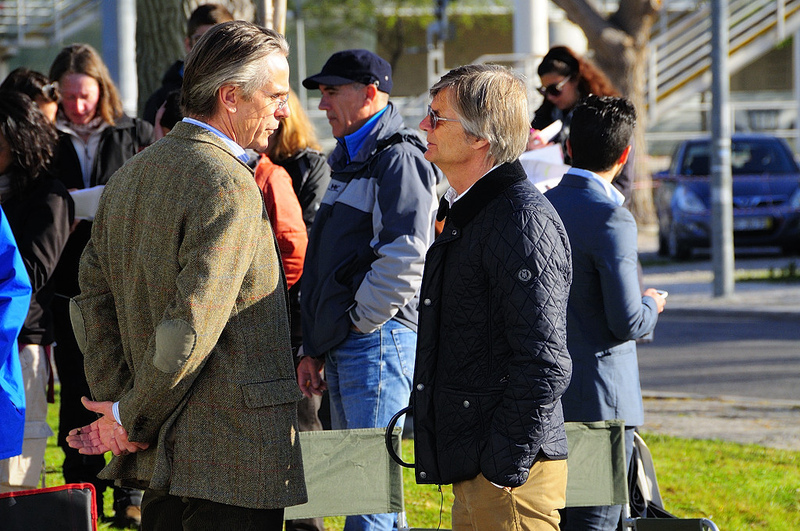 On Sunday, a touch of Hollywood was to feel in Bern. 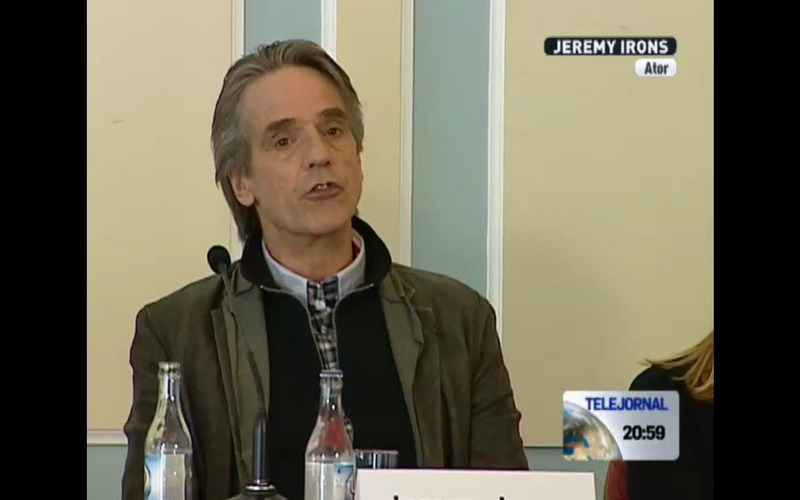 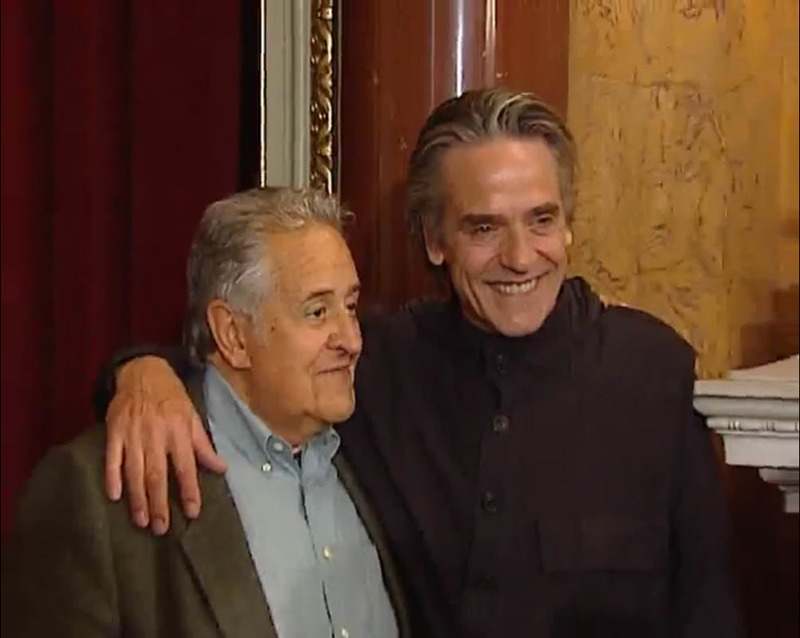 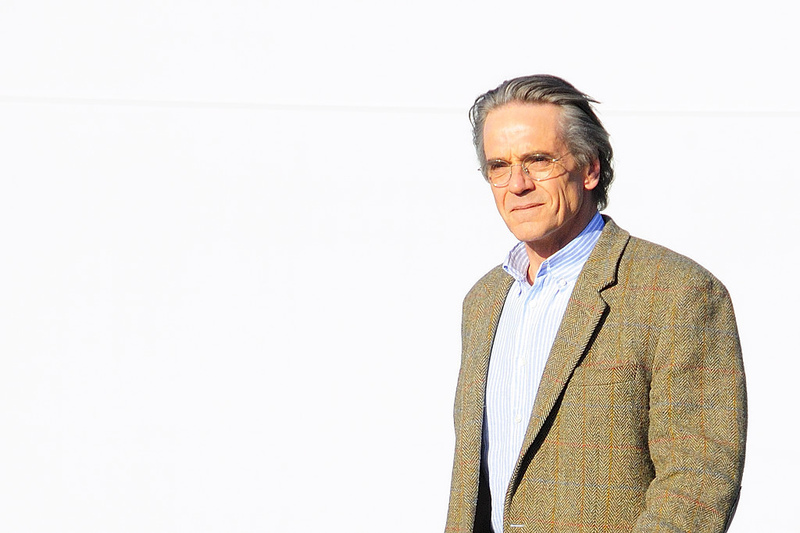 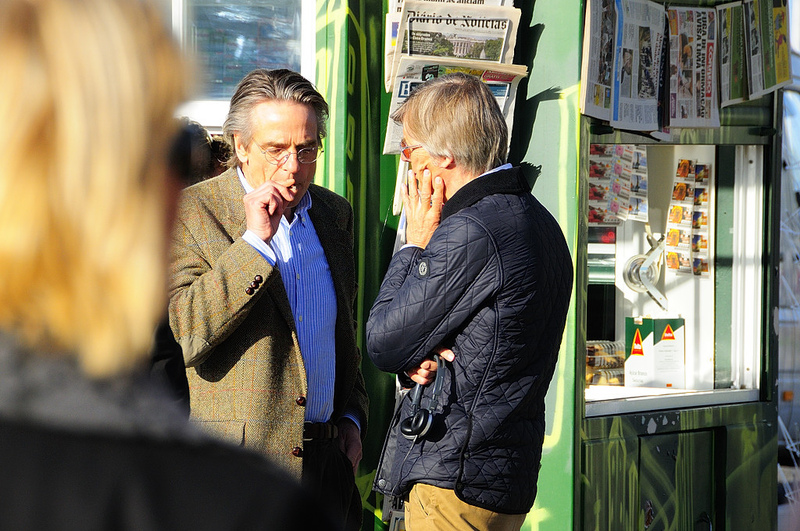 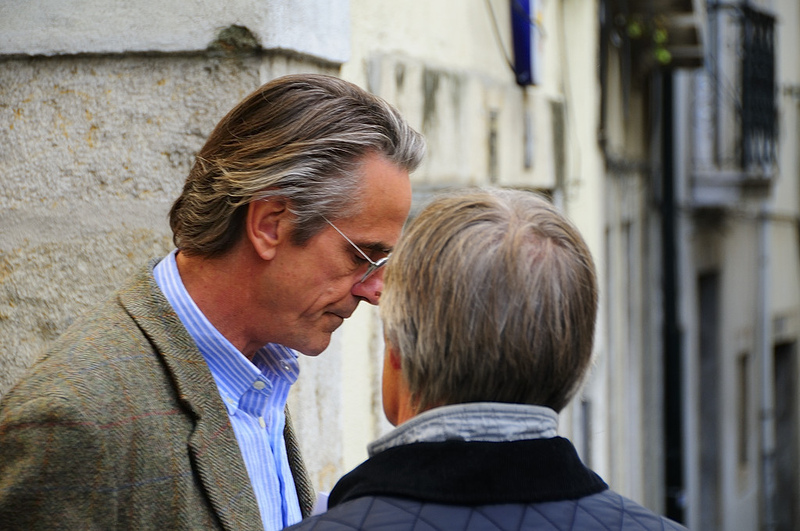 Peter Bieri aka Pascal Mercier and Jeremy Irons – the Bernese author and Oscar-winner. 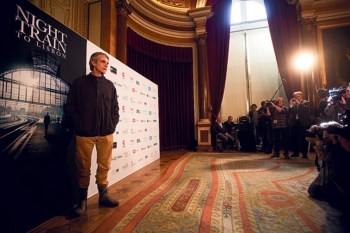 It’s an odd couple, which is this afternoon at the “Salon Royal” in the Bernese Nobel presents Bellevue hotels to the press and gives information about the film adaptation of Mercier’s buyer, “Night Train to Lisbon”. 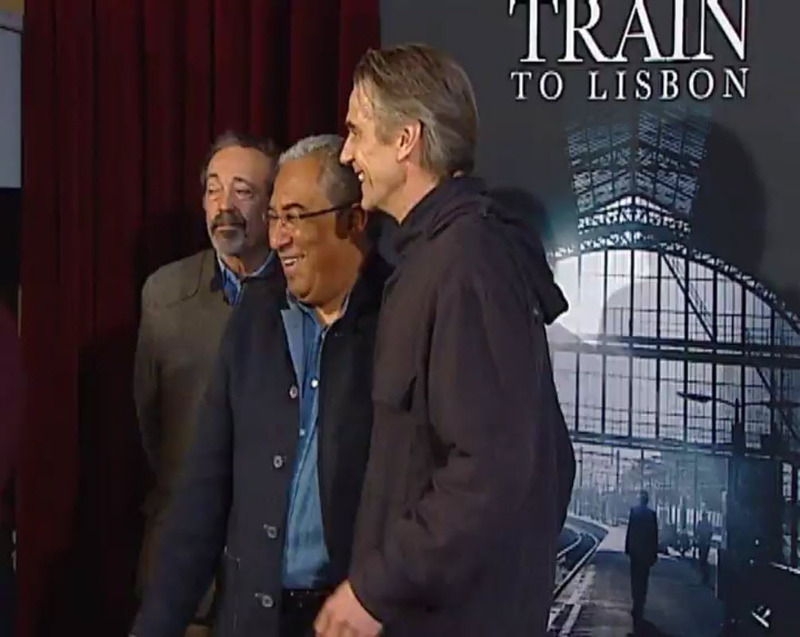 The “Night Train to Lisbon ‘has its origin in the church-span bridge. 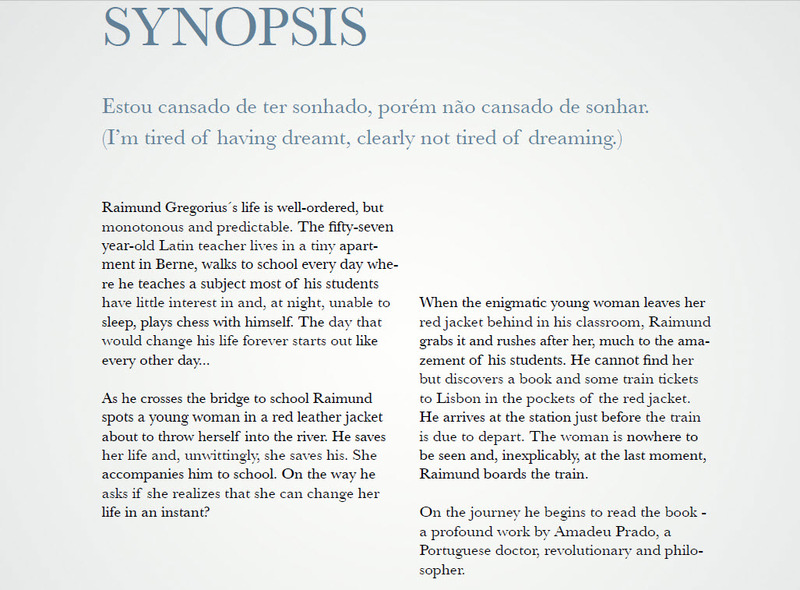 The Latin teacher Raimond Gregory, the film embodies Irons met there a nice Portuguese and the “Night Train” is on the move. 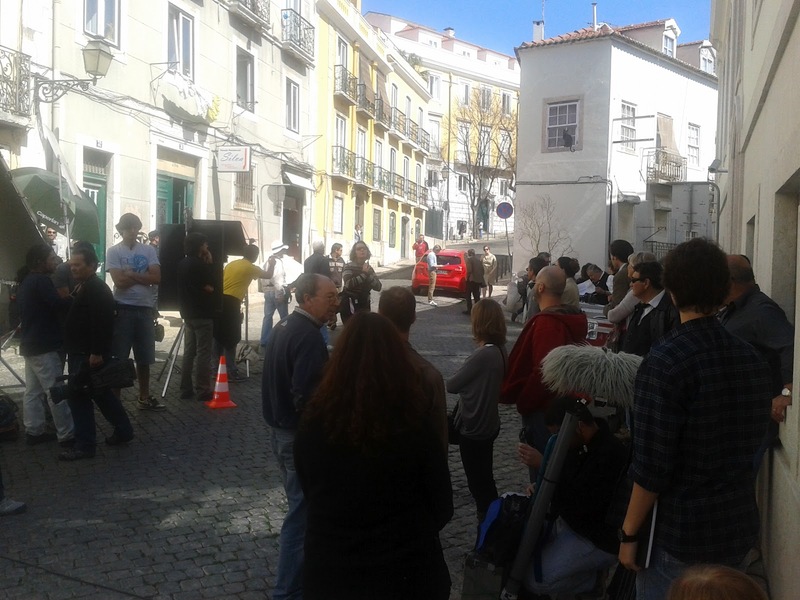 The federal capital was during the last few days now and the first stop of the film crew, the novel takes on Canvas Bieri. 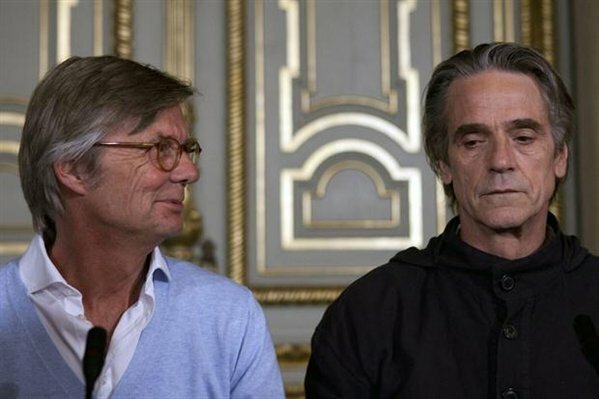 On Sunday, the cameras caught by Danish director Bille August, the fateful meeting at a church-span bridge, was also shot in the church school box itself, in an old house, in the Book of Books and wild at the central station. 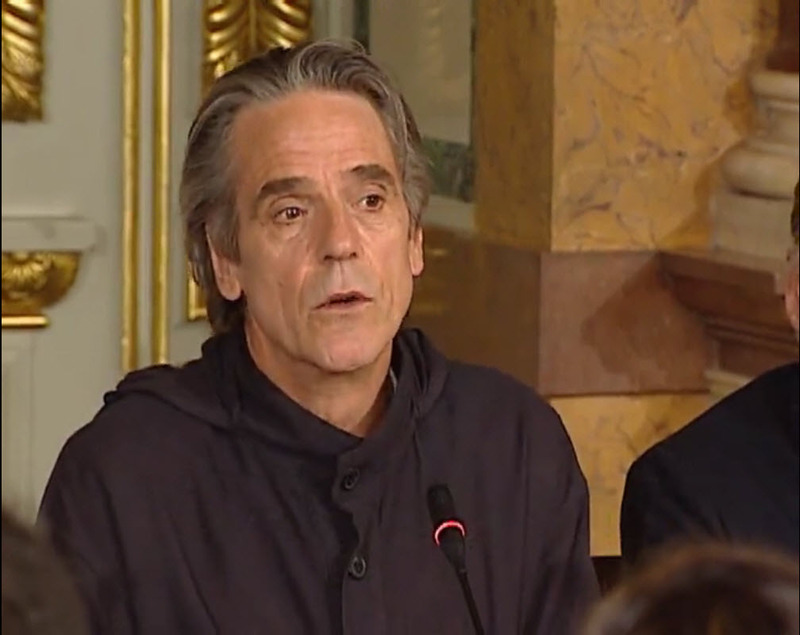 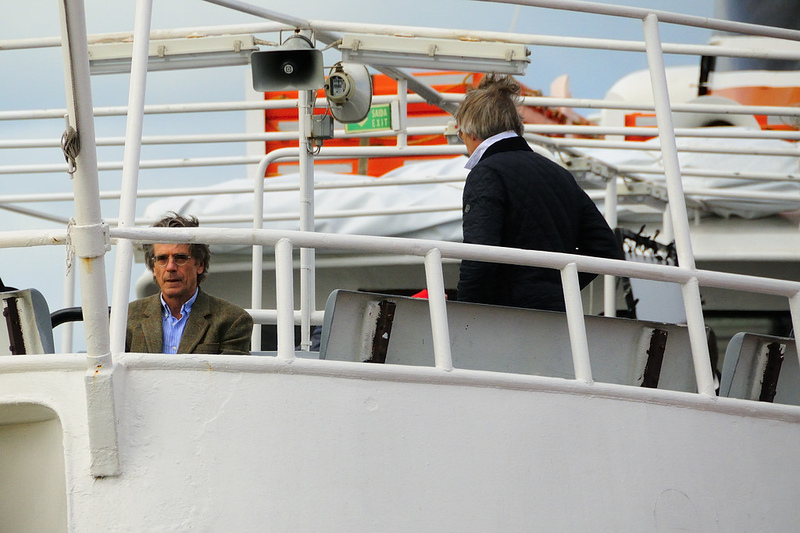 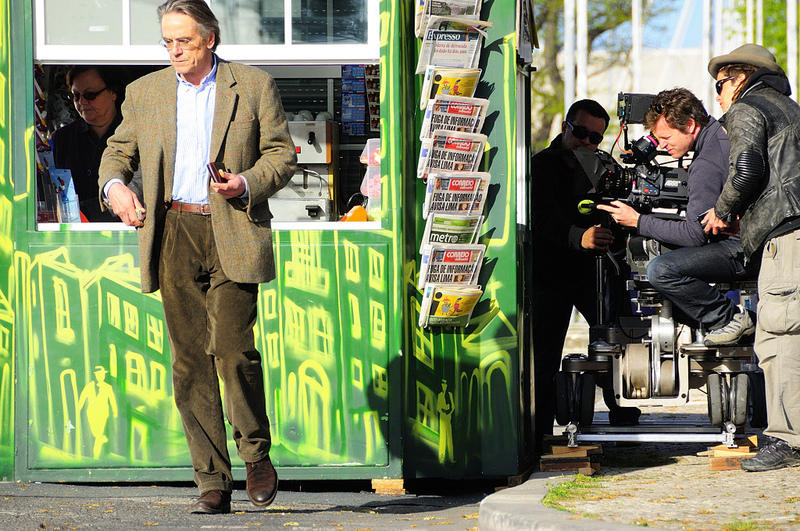 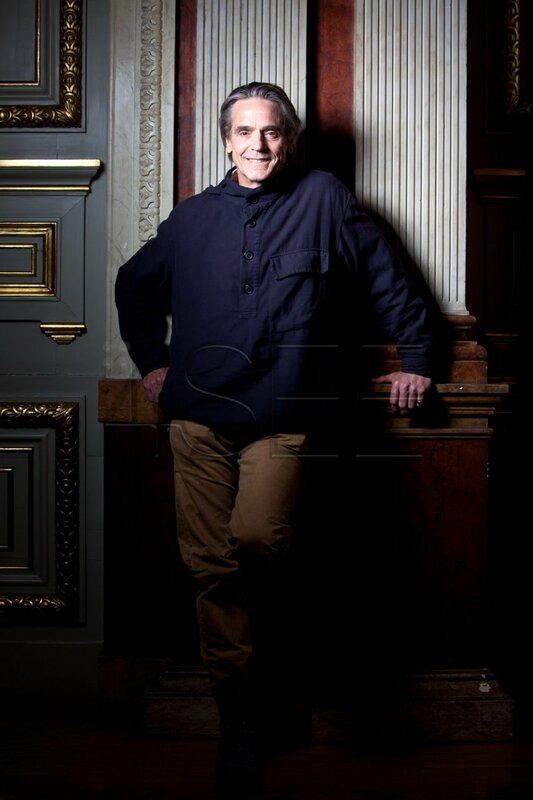 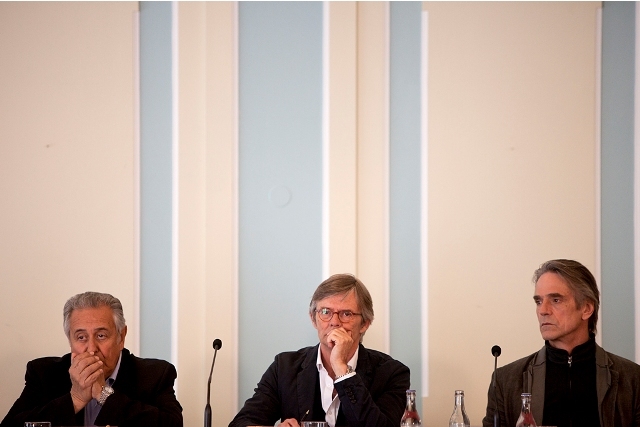 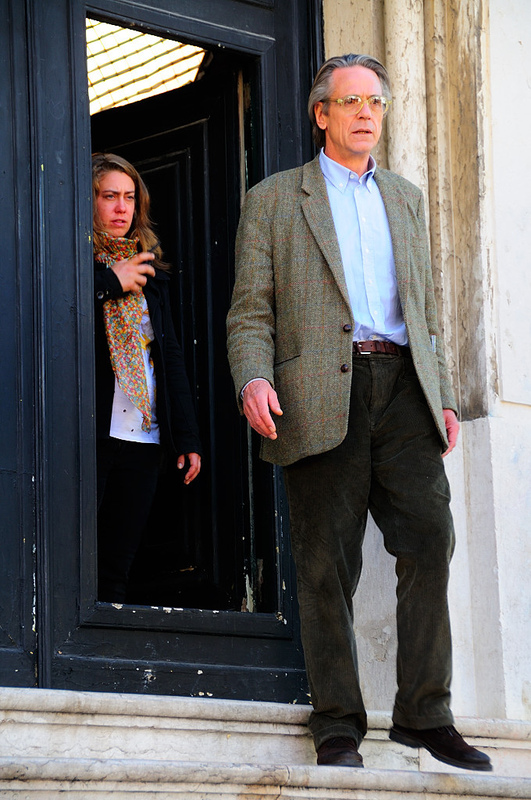 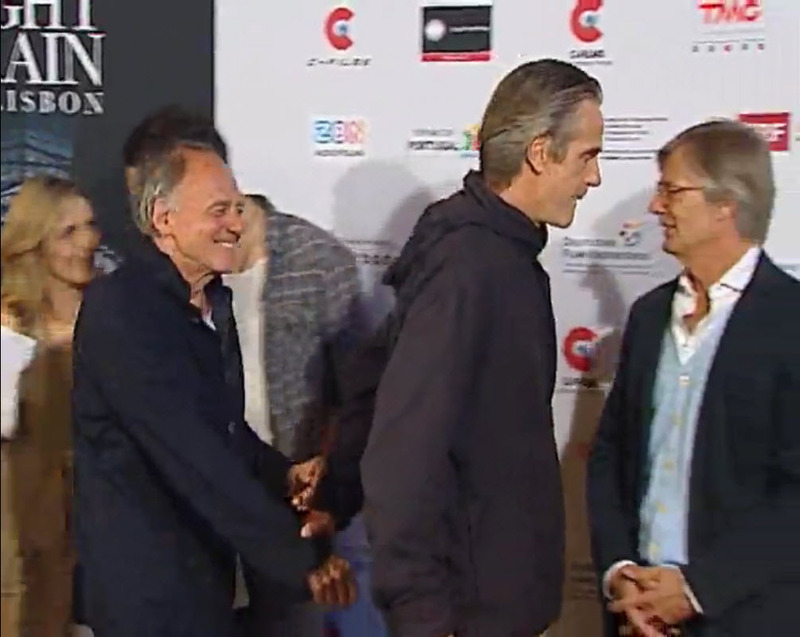 While Jeremy Irons in the flashlights of the cameras tend to look bored, Peter Bieri seems not quite in his element. The journalists’ questions, he answered cautiously, while Irons soon falls into raptures. 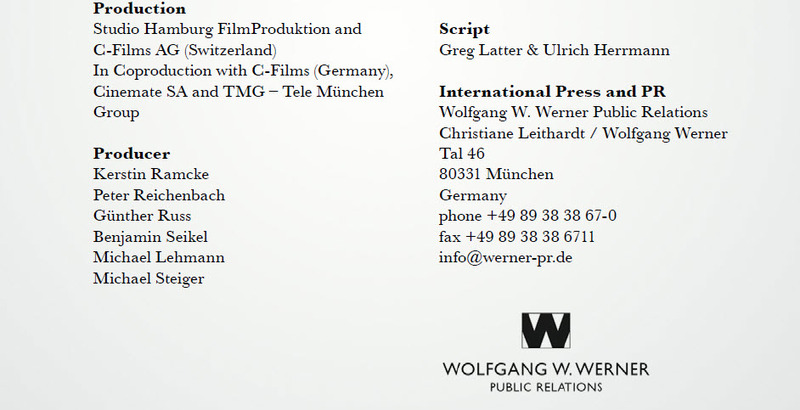 Producer and director to respond with laughter. 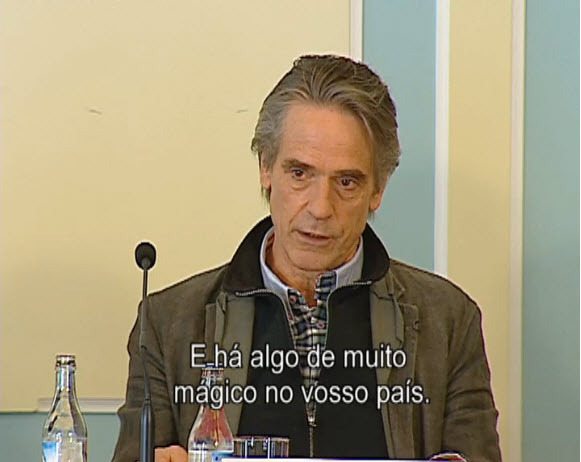 Reichenbach takes the floor: It stands without question that we are now very common to find a set Bieri, who bring the essence of the book in a nutshell. 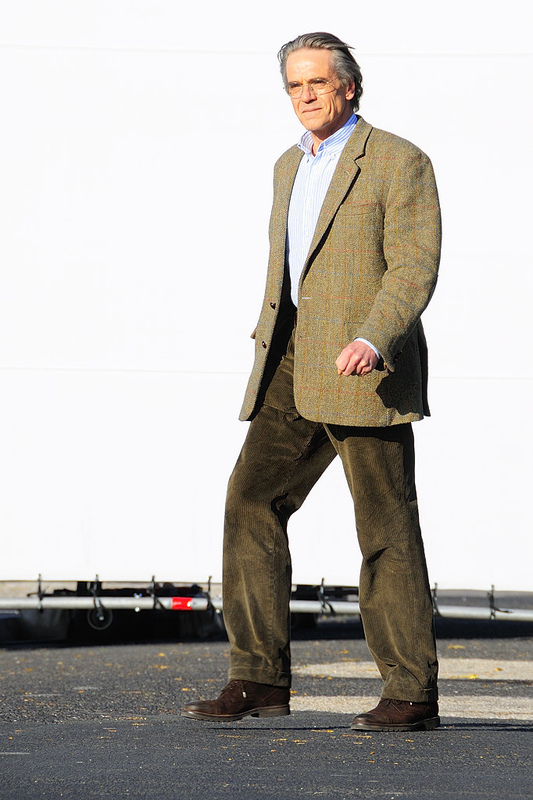 “One that sounds good,” he adds with a grin. 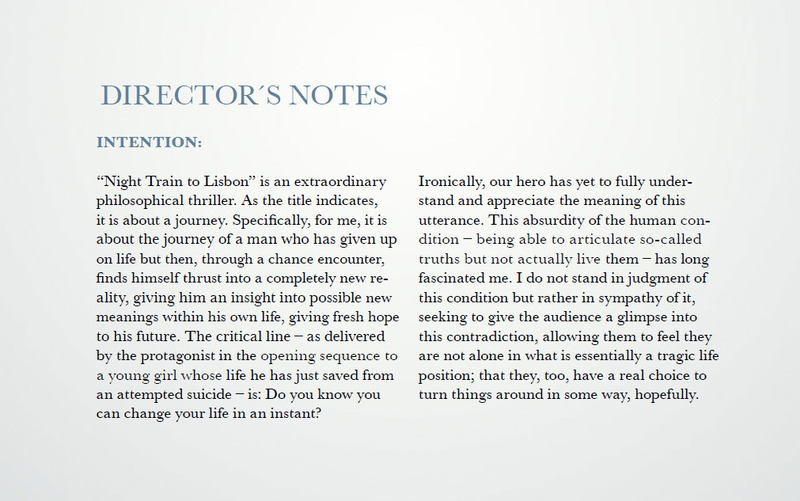 But one must see clearly: The film is not in the box and nobody knows exactly how he would ultimately be. 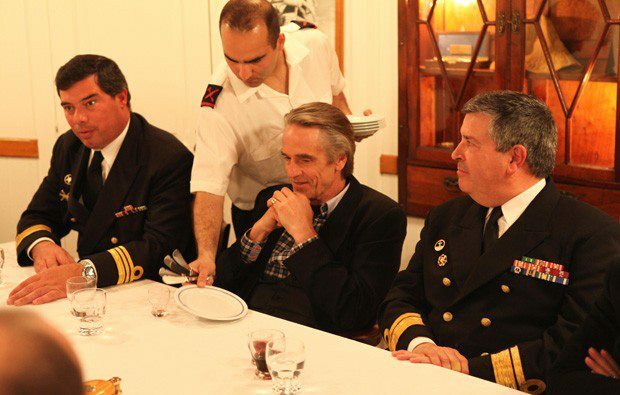 “Not until you drink it, you actually smell it,” adds Irons. 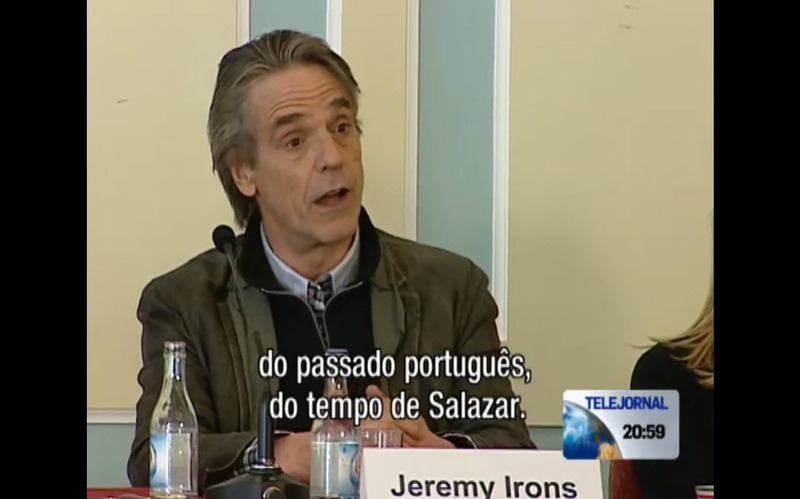 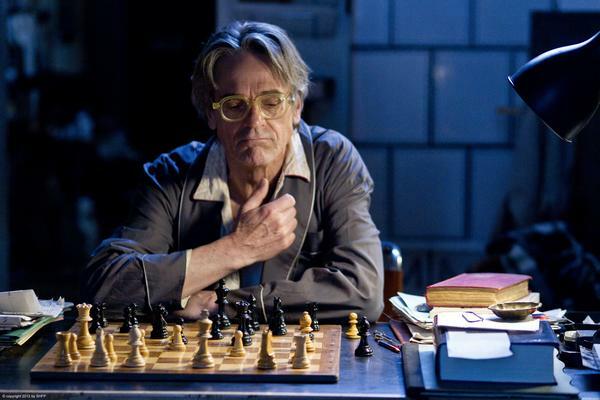 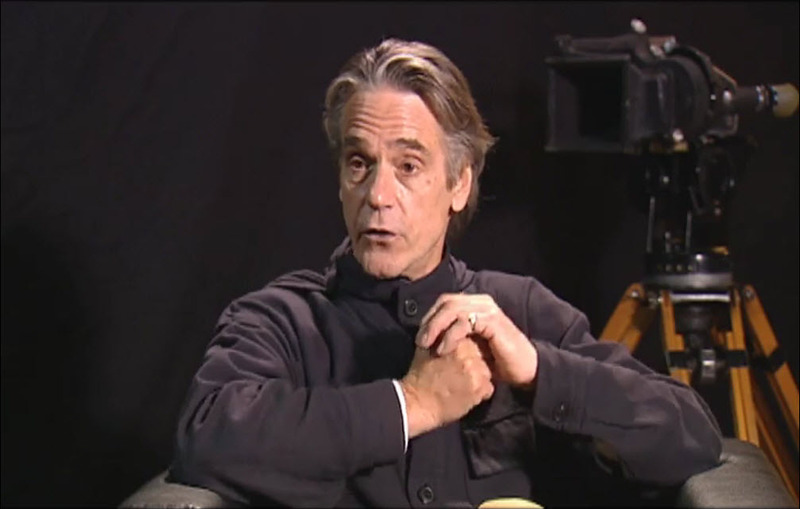 Jeremy Irons talks to 20 minutes. 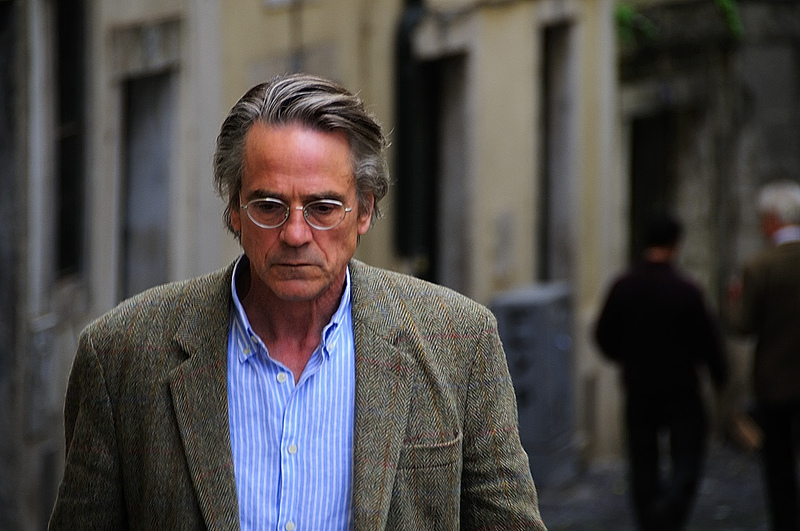 In the film adaptation of the eponymous novel by Swiss author Peter Bieri of the 63-year-old slips into the role of a Bernese teacher who one day breaks out of his everyday life. 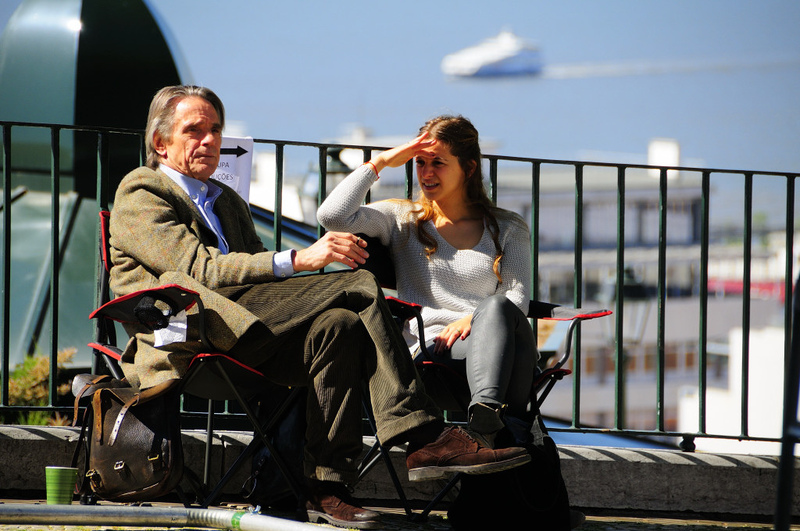 “I think he is typically Swiss. 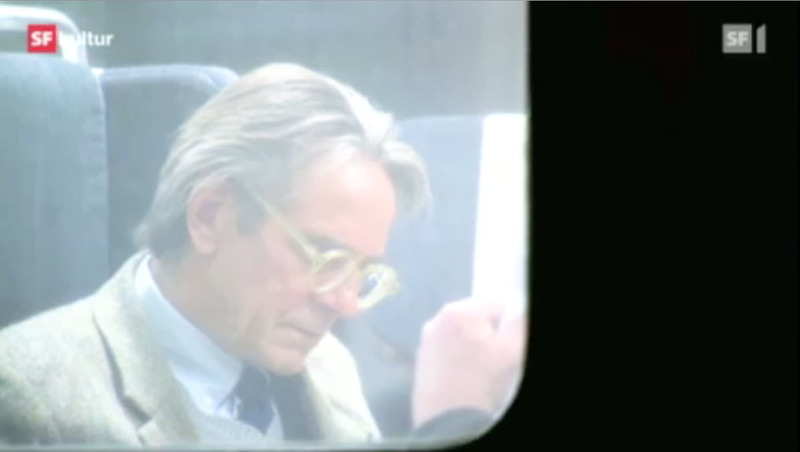 His life is in a controlled manner, as the tracks of a train, so Irons »to 20 minutes. 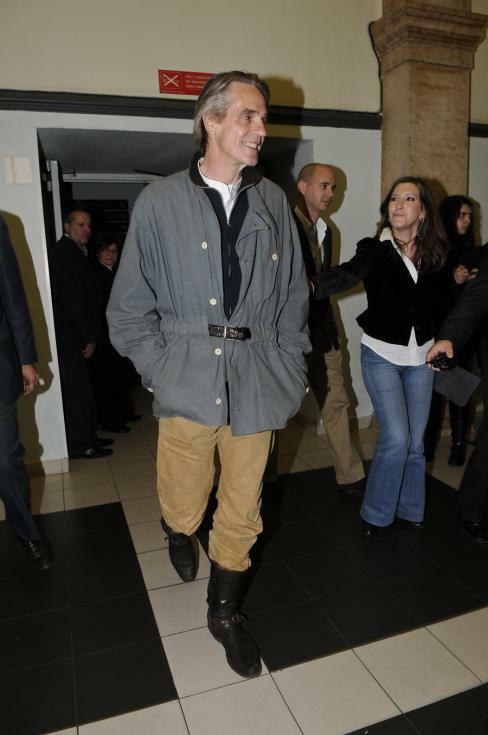 Quite different from him. 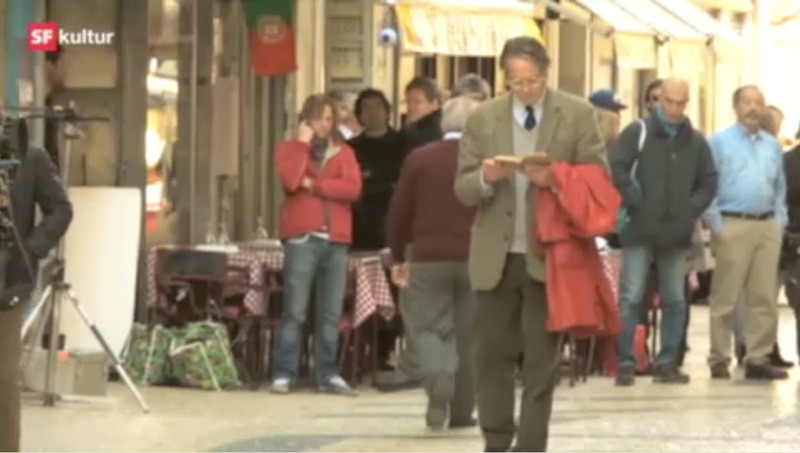 “I am a Roma, an eternal traveler,” he says. 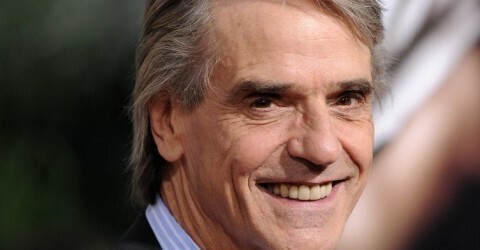 Put themselves in the role of a Swiss father, he remembered – the stars, thank – but not heavy. 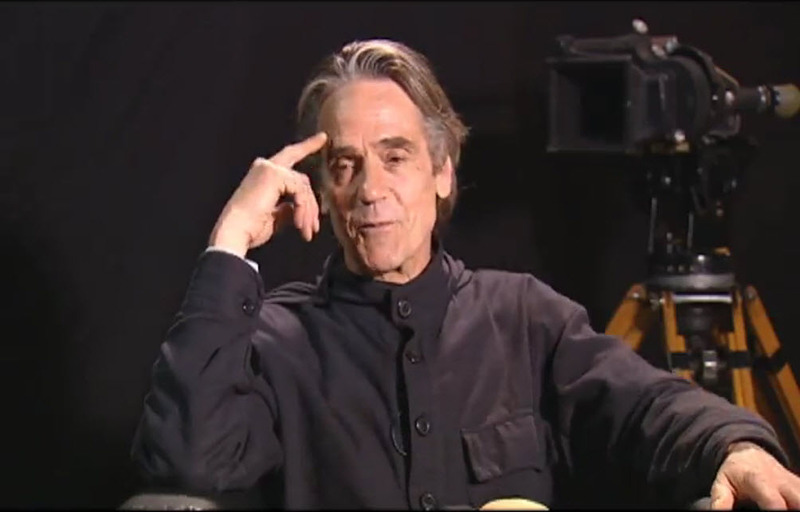 “I was born under the zodiac sign Virgo, so I’m very organized. 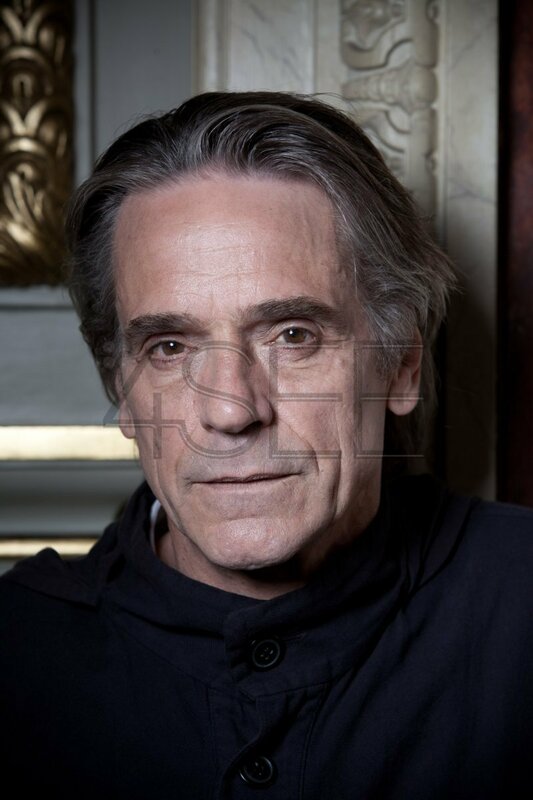 And among you there must be many pretty young women, almost everything works here, “jokes Irons.